Passed quaint German town after quaint German town! We found the parking lot after passing it and making a U-turn. 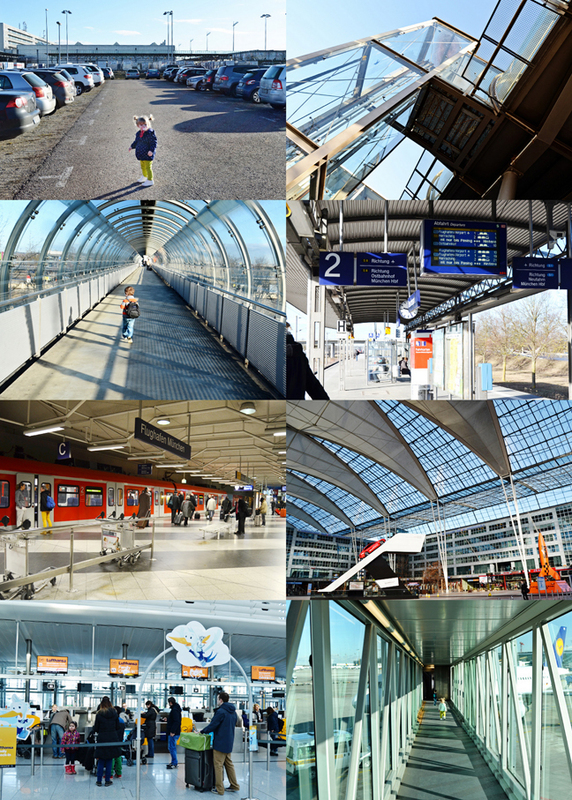 We parked, followed another couple who looked like they knew what they were doing, took an elevator up to a walkway to the "S-bahn" train, waited just a minute or two for the train, rode it the short trip into the airport, made our way to Terminal 1 which required walking through an outdoor space with cars and rockets on display, found the Lufthansa family check-in counter, weaved our way through security, found our gate, the plane was already there, then we boarded! Phew! Now that we've done this once we'll have it down pat next time. Peace out Germany! See you soon! Fox watched a show on the iPad. They gave out sandwiches! Not just a tiny bag of peanuts. 5 stars for Lufthansa! Oh my goodness we passed over the Swiss Alps and they were amazing to behold! 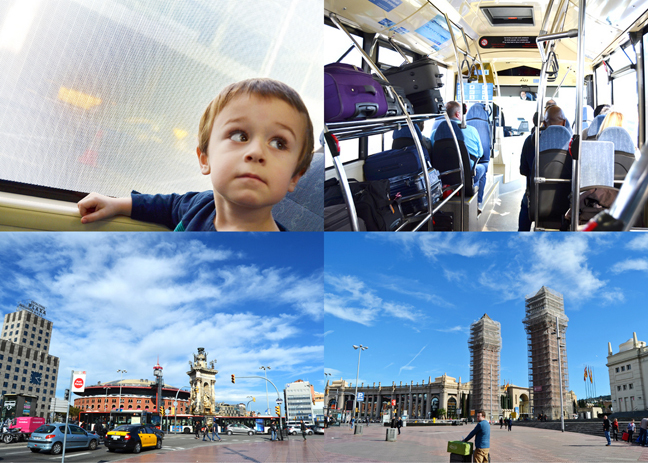 Just a short hour and a half later we landed in Barcelona, without a hitch! The kids were hamming it up for the camera. into the heart of Barcelona! Everything had been going so smooth! Had been...right until we got to the subway we needed to take to get to our hotel... no elevators! Nor escalators! And the stroller didn't fit through the gates! Chris had to lug all of our stuff up and down about 10 flights of stairs, we had to switch metro lines, and it was pretty much a bad experience. Luckily people offered to help and were so nice. At long last, we reached our stop and headed out into the semi-seedy neighborhood our hotel was in. What the what????? A concrete barfing man embedded into the wall. You don't see things like this every day! Home sweet home for the next 3 days! Our room. Tiny, but had everything we needed so it's all good. We dropped off our stuff then quickly headed back out because the sun was setting fast but the weather was beautiful and we had a lot of ground to cover! 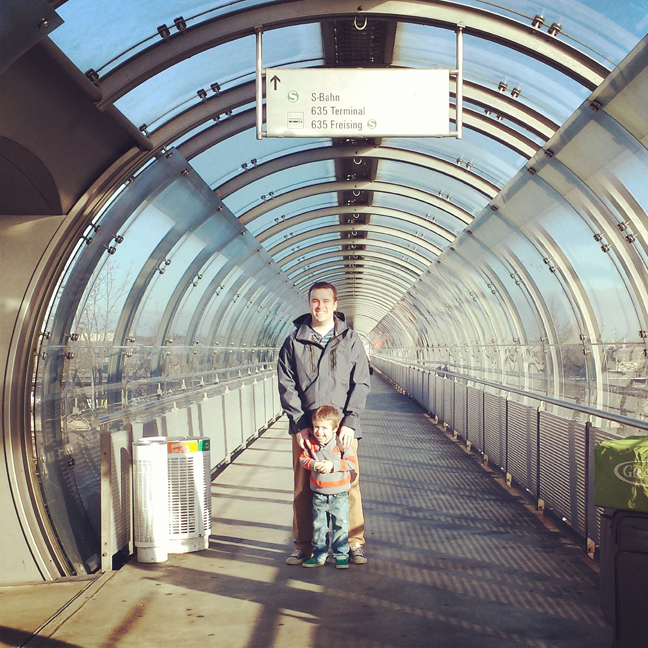 Without baggage navigating the Metro was much easier! Barcelona may be Spain's second biggest city, but it's undoubtedly the first city of the proud and distinct region of Catalunya! Barcelona is full of history - there are Roman ruins, a medieval cathedral, twisty Gothic lanes, and traces of Columbus and the sea trade. As the Age of Exploration steered trade from the Mediterranean to the Atlantic, things got pretty quiet here - kept carefully under the thumb of Spanish rulers. But by the late 19th century, the city had boomed into an industrial powerhouse and a cradle of Modernism. A teenage Picasso lived in Barcelona right when he was on the verge of reinventing painting. Catalan architect Antoni Gaudí remade the city's skyline with curvy fantasy buildings - culminating in Gaudí's over-the-top Sagrada Família, a church still under construction. Salvador Dalí and Joan Miró join the long list of world-changing 20th-century artists with ties to this city. Meanwhile, World's Fairs in 1888 and 1929 helped spruce up the city and in 1992 Barcelona hosted the Summer Olympics. 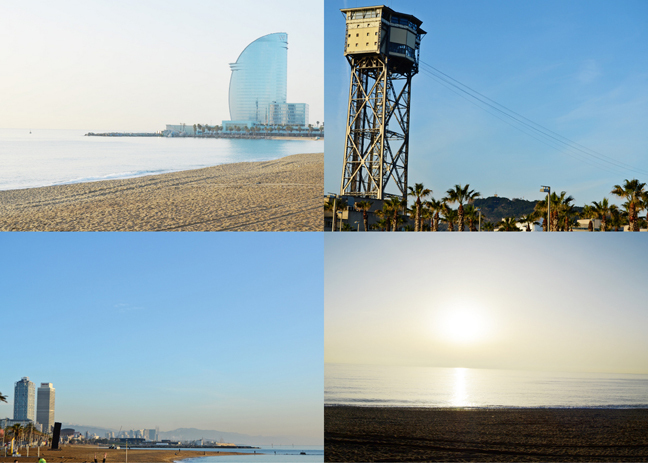 Like Los Angeles, Barcelona is a basically flat city that sprawls out under the sun between the sea and the mountains. It's huge with 1.6 million people and about 5 million people in greater Barcelona. Catalunya is not the land of bull-fighting and flamenco that many visitors envision when they think of Spain - best wait until you're in Madrid or Sevilla for those. The region of Catalunya - with Barcelona as its capital - has its own language, history, and culture, and the people have a proud, independent spirit. Historically, Catalunya has often been at odds with the central Spanish government in Madrid. The Catalan language and culture were discouraged, or even outlawed, at various times in history, as Catalunya often chose the wrong side in wars and rebellion against the kings in Madrid. In the Spanish Civil War (1936-1939) Catalunya was one of the last pockets of democratic resistance against the military coup of the fascist dictator Francisco Franco. 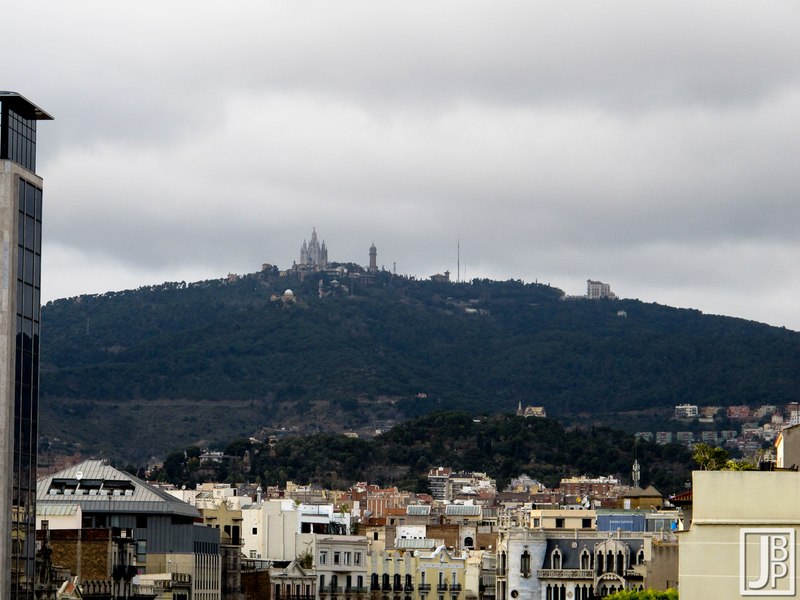 Citadel Park, the Castle of Montjuïc, and the Sacred Heart Church atop Tibidabo are reminders of royal and Franco-era suppression. The main symbol of Catalunya is the dragon, which was slain by St. George, the local patron saint. There are dragons all over Barcelona along with the Catalan flag - called the Senyera - with four horizontal red stripes on a gold field (which comes from a war story of four bloody fingers swiped across a copper shield). 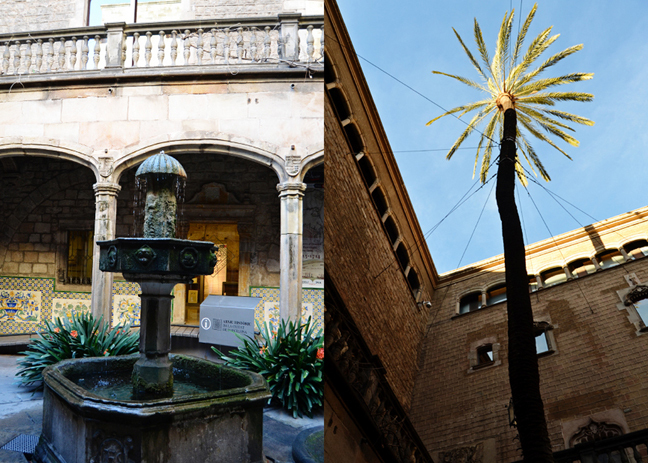 Our first stop was Barcelona's Gothic Quarter. It's a bustling world of shops and nightlife packed into narrow, winding lanes and courtyards. This is Barcelona's birthplace - where the ancient Romans built a city, where medieval Christians built their cathedral, and where Barcelonans lived within a ring of protective walls until the 1850s when the city expanded. 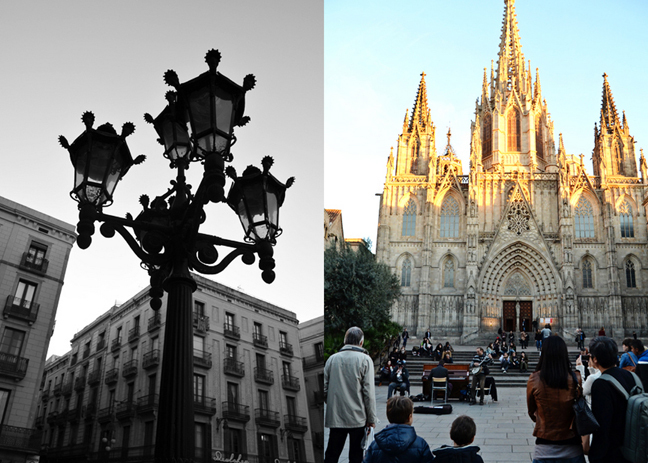 Today, this area is Barcelona's most historic neighborhood. 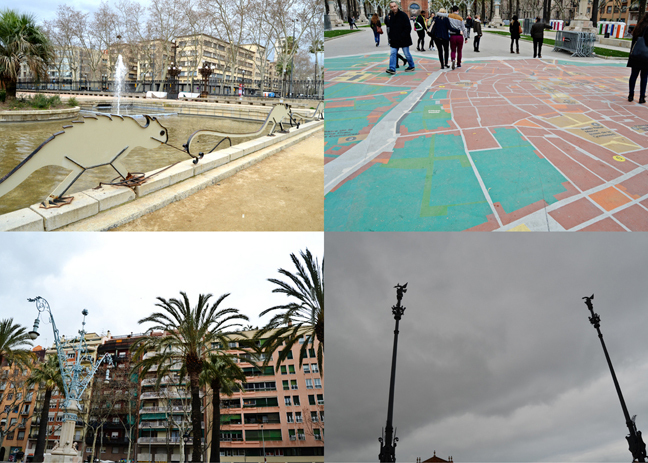 We started our self-guided walk with our trusty Rick Steves' guide at the Plaça de Catalunya. 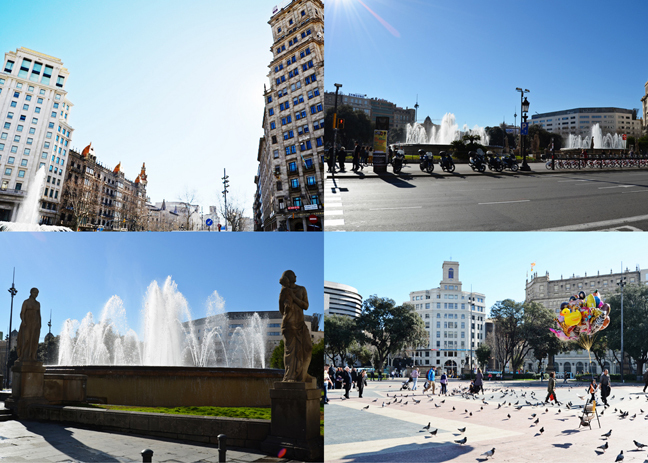 Dotted with fountains, statues, and pigeons and ringed by Art Deco buildings, this plaza is Barcelona's center. It's where Barcelona congregates to watch soccer matches on the big screen, to demonstrate, to celebrate, and to enjoy outdoor concerts and festivals. Geographically, the 12-acre square links old Barcelona (the narrow streets to the south) with the new (the broad boulevards to the north). At the southeast corner, near one of the many El Corte Inglés stores, we headed downhill along the broad pedestrian boulevard called Avinguda Portal de l'Angel. For much of Barcelona's history this was one of the main boulevards leading into town. A medieval wall enclosed the city and there was an entrance here - the "Gate of the Angel" where the street name comes from. An angel atop the gate kept the city safe from plagues and bid voyagers safe journey as they left the security of the city. Today the street is globalized with national chain stores. We paused to admire the Carrer de Santa Anna building and it's beauty. Next we went to the Church of Santa Anna. This 12th-century gem was one of those extra muro churches with its marker cross still standing outside. As part of a convent the church has a fine cloister and an arcaded walkway around a leafy courtyard. We heard the lovely strains of worshippers drifting through the halls as we walked around. Inside is a bare Romanesque interior and Greek-cross floor plan topped with an octagonal wooden roof. The recumbent knight-tomb is of Miguel de Boera, renowned admiral of Charles V.
We continued down Avinguda Portal de l'Angel and turned left at Carrer de Montsió to Els Quatre Gats (The Four Cats). This restaurant is a historic monument. It's famous for being the circa-1900 bohemian-artist hangout where Picasso nursed drinks with friends and first publicly hung his art in 1897 at age 16. Stepping inside we felt the turn-of-the-century vibe. Rich Barcelona elites and would-be avant garde artists looked to Paris, not Madrid, for cultural inspiration, hence it looks Parisian a bit. The story of the name of The Four Cats? When the proprietor told his friends that he'd be open 24 hours a day they said, "No one will come. It'll just be you and four cats" (Catalan slang for "a few crazy people"). At the fork in the road is a fountain with blue-and-yellow tilework depicting ladies carrying jugs of water. In the 17th century this was the last watering stop for horses before leaving town. 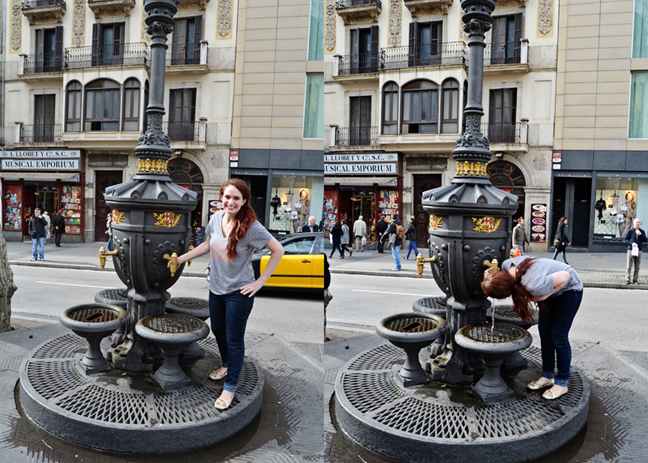 As recently as 1940 one in nine Barcelonans got their water from fountains like this. It's still used today. Cool lookin' H&M building! And the fountain again. 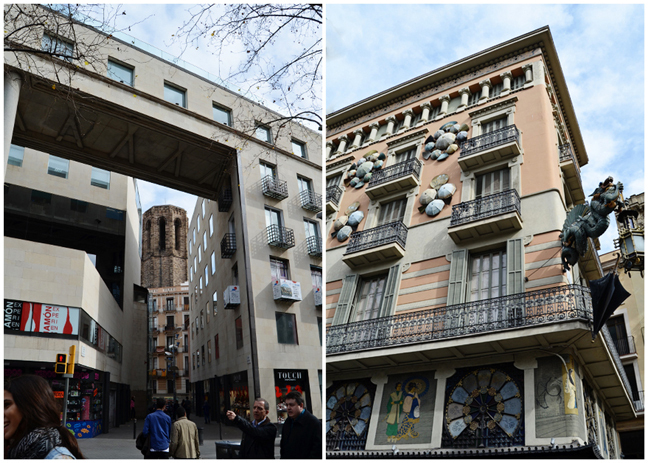 Continuing on, we found the modern Catalan College of Architects building with a frieze designed by Picasso in 1960. In his distinctive style it shows branch-waving kings and children celebrating a local festival. At the Plaça Nova two bold Roman towers flank the main street. 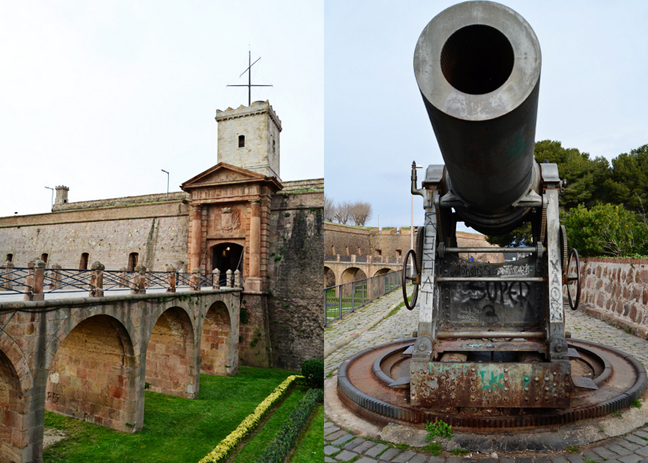 These once guarded the entrance gate of the ancient Roman city of Barcino. The big stones that make up the base of the reconstructed towers are actually the original Roman stones. At the base of the towers are modern bronze letters spelling out "BARCINO" - the city's name may have come from Barca, one of Hannibal's generals who is said to have passed through during Hannibal's roundabout invasion of Italy. One of the towers has a section of Roman aqueduct. These bridges of stone carried fresh water from the distand hillsides into the walled city. Here the water supply split into two channels, one to feed Roman industry, the other for the general populace. The Roman aqueducts would be the best water system Barcelona would have until the 20th century. 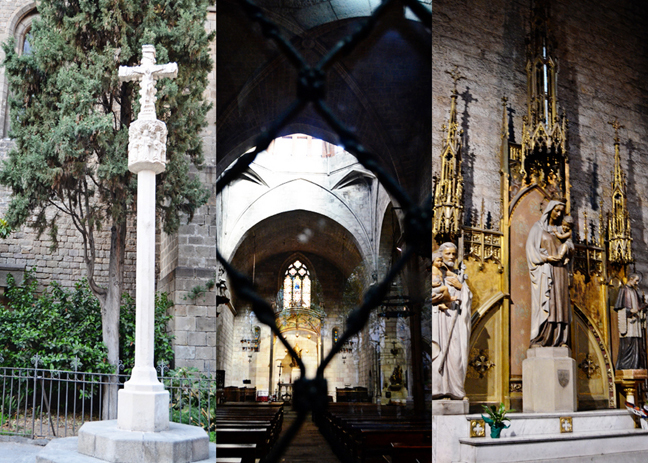 And of course, the main attraction of this walk, the Cathedral of Barcelona. This location has been the center of Christian worship since the fourth century and this particular building dates (mainly) from the 14th century. The facade is a virtual catalog of Gothic motifs: a pointed arch over the entrance, robed statues, tracery in the windows, gargoyles, and bell towers with winged angels. The style is French Flamboyant, meaning "flame-like," and the roofline sports the prickly spires meant to give the impressions of a church flickering with spiritual fires. We weren't able to go inside because my dress wasn't covering my knees. Oopsies! Next time! 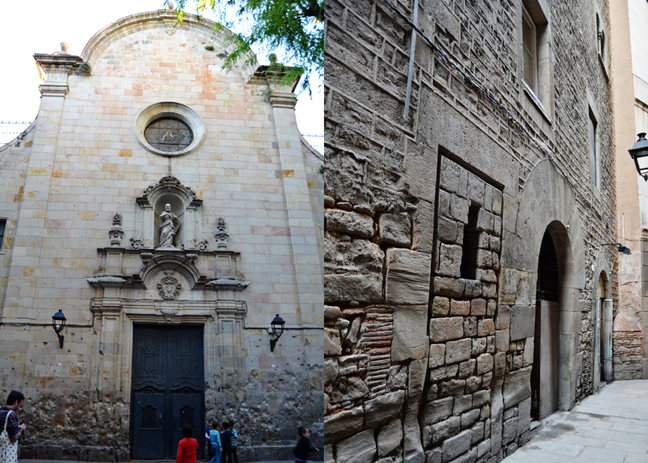 Around the corner of the cathedral between the towers and down the Carrer del Bisbe is the Casa de l'Ardiaca - which was once the archdeacon's house and today functions as the city archives. The kids had fun playing in the water fountain. Why are kids drawn to water like magnets? The century-old palm tree in the courtyard is held in place by lots of wires! Continuing down Carrer del Bisbe is a small square with a bronze statue ensemble. Five Barcelona patriots calmly receive their last rites before being strangled for resisting Napoleon's 1809 invasion of Spain. They'd been outraged by French atrocities in Madrid. The plaque marking their mortal remains says these martyrs to independence gave their lives for God, country, and king. 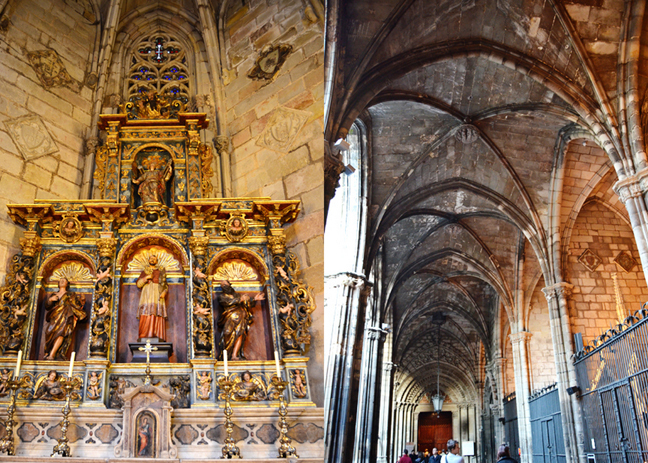 There's a side entrance to part of the Cathedral of Barcelona so we went in for a bit. 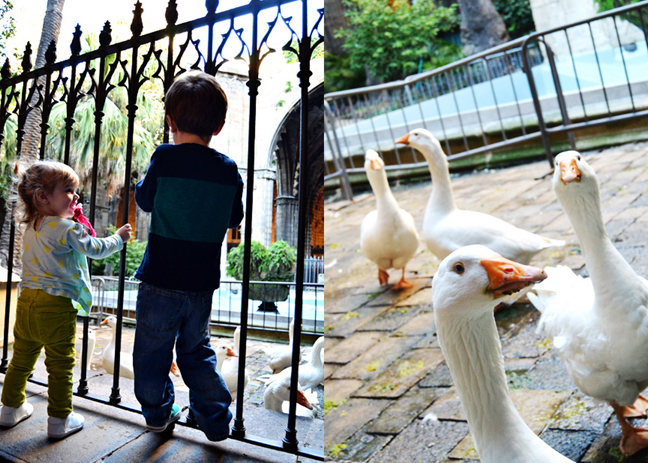 In the courtyard was a flock of ducks! Random! Fox and Jane got a big kick out of the ducks that were so close they could have pecked your eyes out. Sights from our walk: Cool building, the Barcino letters, inside the courtyard at the Archives, Jane pointing to a funny Elvis Presley figurine. Then we meandered over to the Plaça Sant Felip Neri - this square serves as the playground of an elementary school and was bursting with youthful energy just like Rick Steves said it would be. The Church of Sant Felip Neri, which Gaudí attended, is still pocked with bomb damage from the Civil War. That was that, moving on to the Jewish Quarter, or El Call, which means "narrow passage" which this area literally is. I took a picture straight up of how close the buildings are together. Sad. These tight lanes were where medieval Jews were forced to live, under the watchful eye of the nearby cathedral. At its peak, some 4000 jews were crammed into just a few alleys. We walked back to the main street to the Carrer del Bisbe Bridge - this Bridge-of-Sighs-like structure connects the Catalan government building on the right with the Catalan president's residence (ceremonial, not actual). Though the bridge looks medieval it was constructed in the 1920s. We arrived at the Plaça de Sant Jaume. This stately central square of the Barri Gòtic, once a Roman forum, has been the seat of the city government for 2000 years. Today the two top governmental buildings in Catalunya face each other: the Barcelona City Hall and the Palau de la Generalitat (next picture). The Barcelona City Hall sports a huge statue of the king "Jaume el Conqueridor" - not to be confused with Sant Jaume, the plaza's namesake. King Jaume I (1208-1276, also called "the Just") is credited with freeing Barcelona from French control, granting self-government, and setting it on a course to become a major city. Locals treasure the independence these two buildings represent. For more than six centuries Palau de la Generalitat has housed the autonomous government of Catalunya. It always flies the Catalan flag next to the obligatory Spanish one. Above the doorway is St. George slaying the dragon. From these balconies the nation's leaders and soccer heroes greet people on momentous days. There must have been some sort of occasion for celebration because we saw mounds of confetti on the streets yippee! We exited the Plaça de Sant Jaume through the narrow Carrer del Paradís to the Roman Temple of Augustus. We stood at the summit of Mont Táber - the Barri Gotic's highest spot. It was here, atop this "lofty" summit, that the ancient Romans founded the town of Barcino around 15 B.C. They built a fort on the hilltop protecting the harbor. And inside we saw the remains of the imposing Roman temple! These four HUGE columns from around A.D. 1 are as old as Barcelona itself. They were part of the ancient town's biggest structure, a temple dedicated to the Emperor Augustus, worshipped as a god. These Corinthian columns (with deep fluting and topped with leafy capitals) were the back corner of a 120-foot-long temple that extended from here to the Fórum. 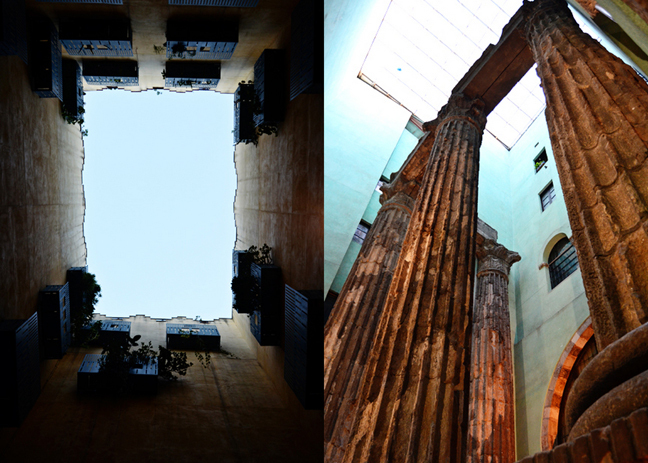 Apartments were literally built right around and into these fascinating columns! WHY!? Probably one of the coolest things I've ever seen. 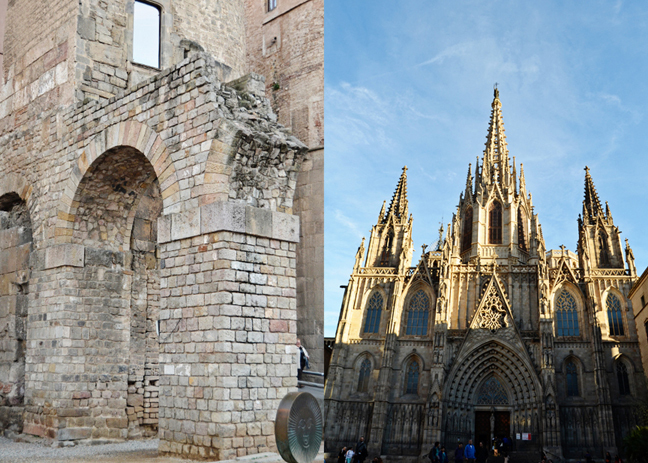 We bumped into the back end of the the Cathedral and then walked to the Plaça del Rei. 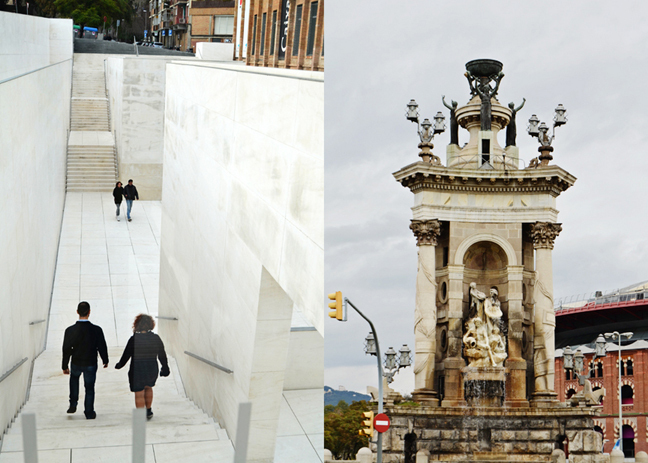 The buildings that enclose this square once housed Spain's kings and queens. The central section (topped by a six-story addition) was the core of the Royal Palace. From the 13th to the 15th centuries, the Royal Palace housed Catalunya's counts as well as resident Spanish kings. In 1493, a triumphant Christopher Columbus (ever heard of him? :), accompanied by six New World natives (whom he called "Indians") and several pure-gold statues, entered the Royal Palace. King Ferdinand and Queen Isabel rose to welcome him home and honored him with the title "Admiral of the Oceans." To the left is the Viceroy's Palace (for the ruler's right-hand man) which also served as the archives of the Kingdom of Aragon (sounds so Lord of the Rings!). After Catalunya became part of Spain in the 15th century the Royal Palace became a small regional residence and the Viceroy's Palace became the headquarters of the local Inquisition. Today the Viceroy's Palace is once again home to the archives. Inside the Viceroy's Palace we found the amazing wood coffered ceilings. Wow. Ironically, Columbus and the Kingdom of Aragon played a role in Barcelona's decline as an independent kingdom. When Ferdinand of Aragon married Isabel of Castile, Catalunya got swallowed up in greater Spain. Columbus' discovery of new trade routes made Barcelona's port less important, and soon the royals moved elsewhere. 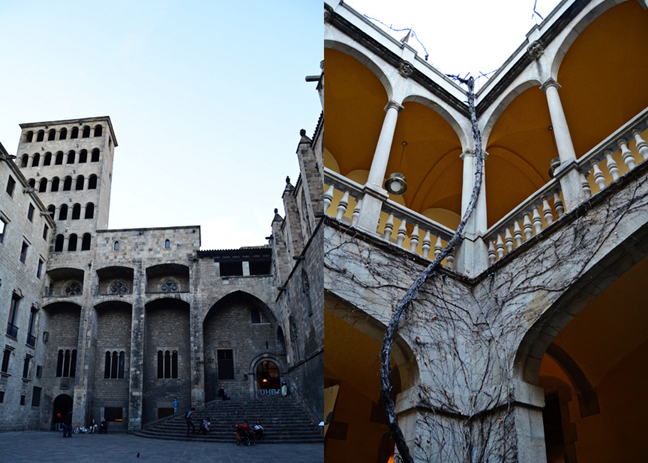 That was the end of the Barri Gòtic walk! On to the next activity! The sun had set but we weren't ready to go back to the hotel for the night so we went on the "Short, Sweet Walk" from the guide book. First we found our way to the ornate chocolate shop called Fargas. Since the 19th century, gentleman with walking canes have dropped by here for their chocolate fix. 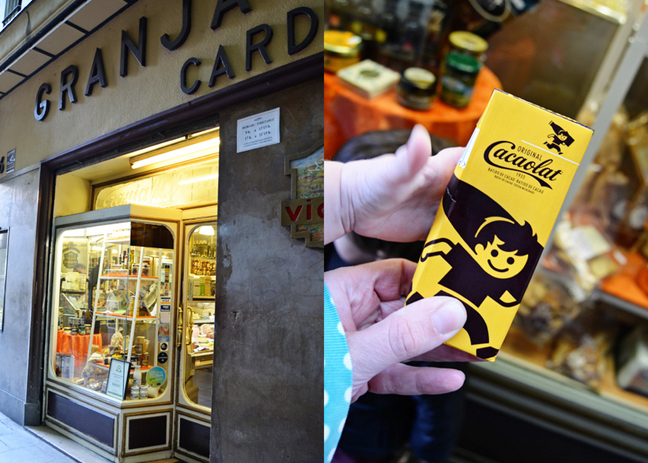 Founded in 1827, this is one of the oldest and most traditional chocolate shops in Barcelona. I waited outside with Jane while Chris and Fox asked for an assortment of the worker's favorites. They were definitely delicious! People kept recommending "churros con chocolate" so I was excited to visit Granha La Pallaresa to try this phenomenon! There was a line of people waiting just to get in! 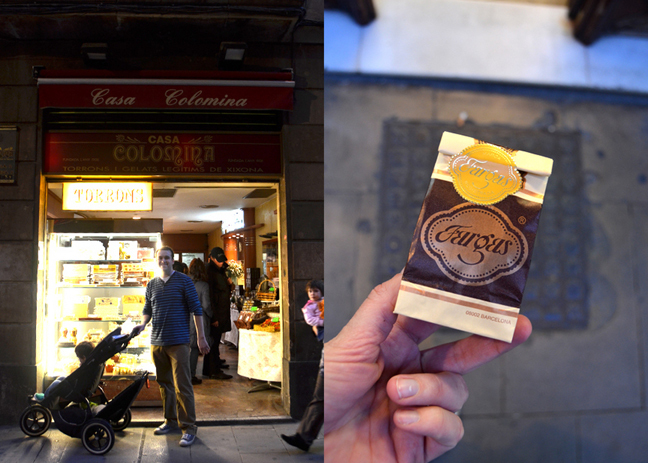 Chris went inside and ordered our sweets then we headed back to the Plaça de Catalunya to find a spot to eat our treats. Churros con chocolate for the win! Chris also got a Spanish variation of Creme Brulee, known as Crema Catalana. Then we made our way back to the hotel and went to sleep after a long and fun day! 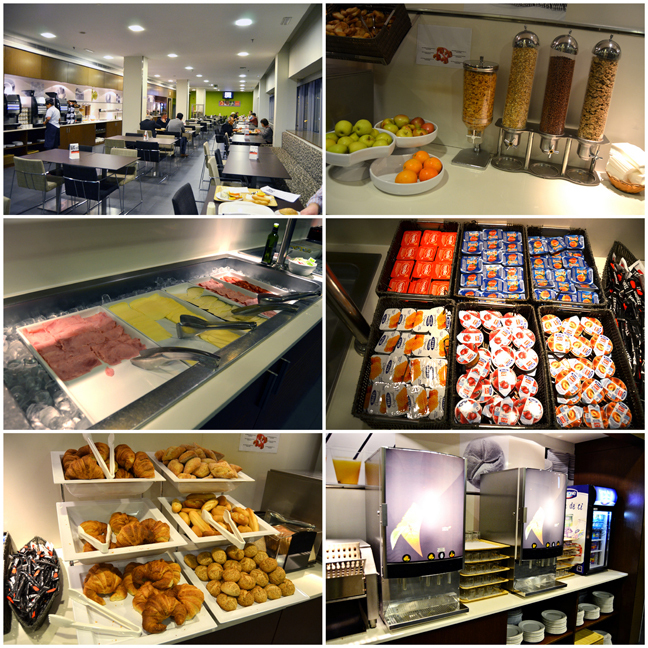 We woke up bright and early and went to the main level of the hotel for breakfast. We enjoyed cereal, bread, meat, cheese, yogurt, and juice. 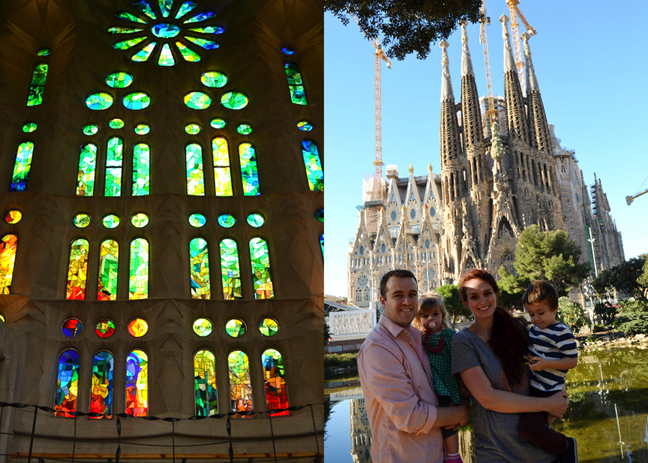 Our first stop of the day: La Sagrada Família! 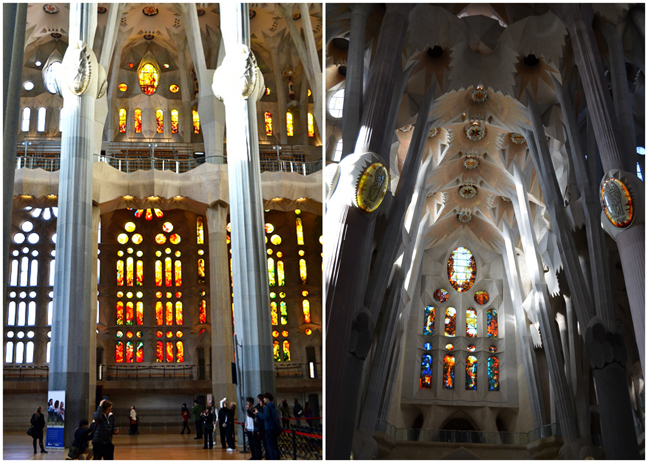 Gaudí's most famous and awe-inspiring work is this unfinished, super-sized church. 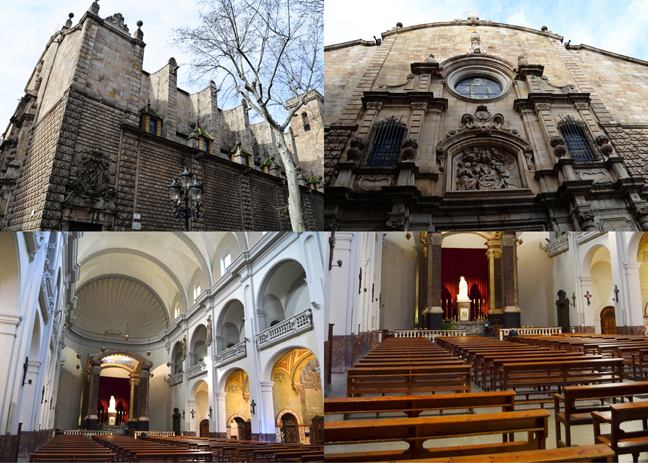 With its "melting candles" facade and otherworldly spires, the church is not only an icon of Barcelona and its trademark Modernista style, but also a symbol of this period's greatest practitioner of that style. 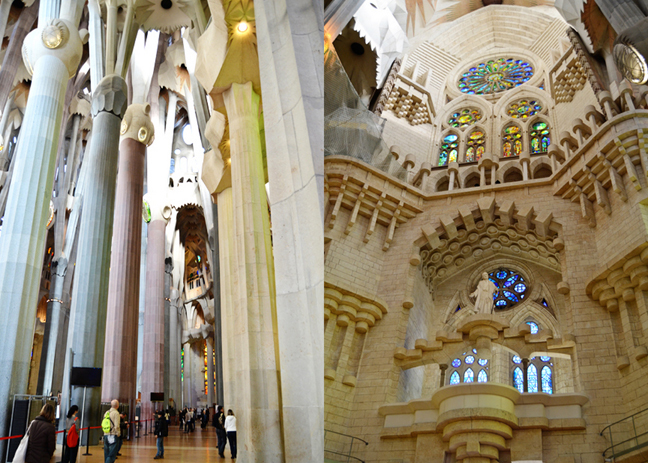 As an architect, Gaudí's foundations were classics, nature, and religion. The church represents all three. Gaudí labored on the Sagrada Famiília for 43 years, from 1883 until his death in 1926. Nearly a century after his death, people continue to toil to bring Gaudí's designs to life. There's something powerful about a community of committed people with a vision, working on a church that won't be finished in their lifetime. 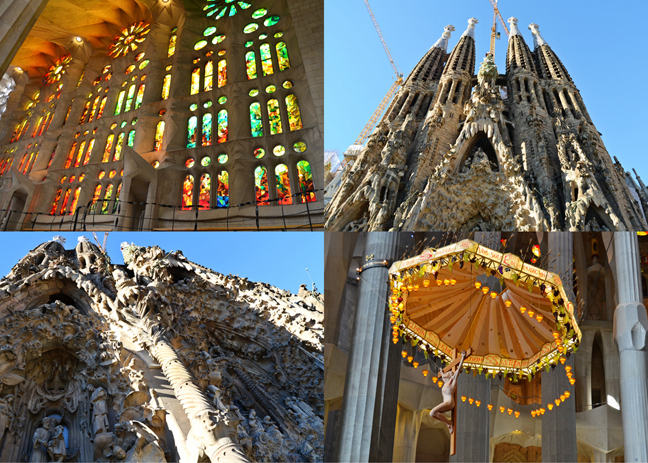 The progress of this remarkable building is a testament to the generations of architects, sculptors, stonecutters, fund-raisers, and donors who've been caught up in the audacity of Gaudí's astonishing vision. With so many people with so many different inputs, I personally think the exterior is a hot mess and hodge podge of styles and personalities, but nevertheless is beautiful to behold. We waited in a long line to buy tickets. Since Gaudí's death construction has moved forward in fits and starts, though much progress was made in recent decades thanks to Barcelona's hosting the 1992 Olympics, the ensuing rediscovery of the genius of Gaudí, and advances in technology. In 2010 the main nave was finished enough to host a consecration Mass by the pope. 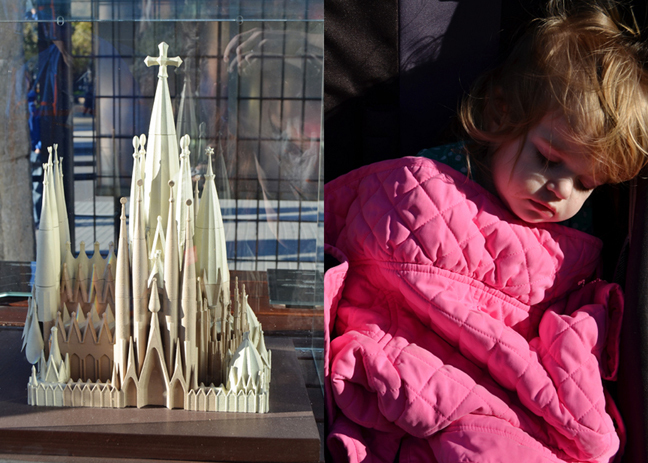 The main challenges today: Ensure that construction can withstand the vibrations caused by the Metro underground, construct the tallest church spire EVER built (as seen in the model below), and find a way to buy out the people who own the condos in front of the planned Glory Facade so that Gaudí's vision of a grand esplanade approaching the church can be realized. 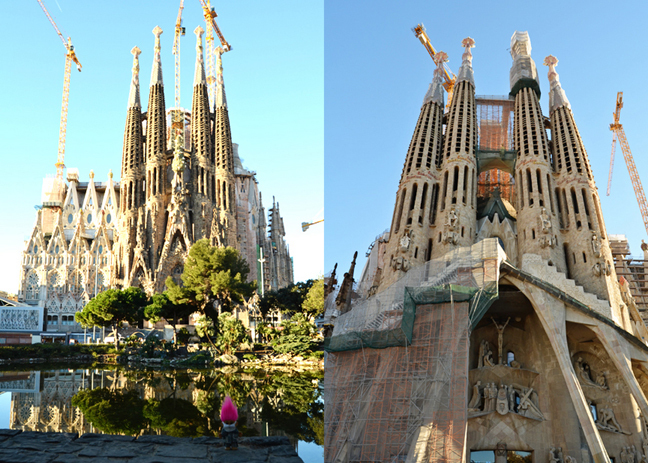 The goal is to finish the church by the 100th anniversary of Gaudí's death in 2026. And a picture of Jane stroller napping. Imagine how grand this church will be when completed! The four 330-foot spires topped with crosses are just a fraction of this mega-church. When finished, the church will have 18 spires. Four will stand at each of the three entrances. Rising above those will be four taller towers, dedicated to the four Evangelists. A tower dedicated to Mary will rise still higher - 400 feet. And in the very center of the complex will stand the grand 560-foot Jesus tower, topped with a cross that will shine like a spiritual lighthouse, visible even from out at sea. The Passion Facade that tourists enter today is only a side entrance to the church. The grand main entrance will be around to the right. That means the nine-story apartment building will eventually have to be torn down to accommodate it. The three facades - Nativity, Passion, and Glory - will chronicle Christ's life from birth to death to resurrection. Inside and out, a goal of the church is to bring the lessons of the Bible to the world. Inside, is, well, you'll just have to see it for yourself because pictures will never ever do it justice. Clear glass windows are being replaced by stained glass and splashes of color breathe even more life into this amazing space. 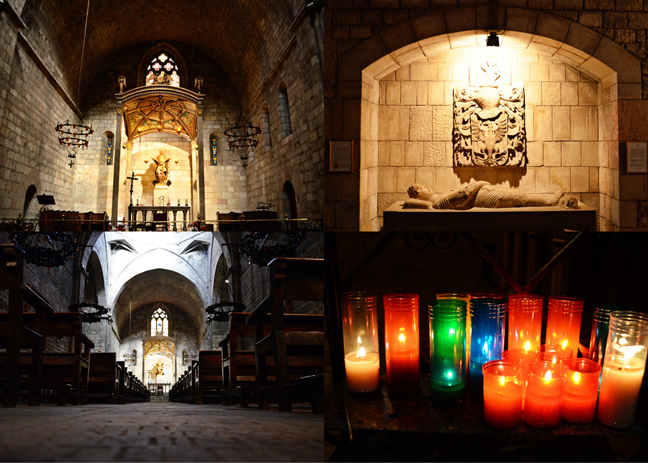 Typical of even the most traditional Catalan and Spanish churches, the floor plan is in the shape of a Latin cross, 300 feet long and 200 feet wide. Ultimately, the church will encompass 48,000 square feet, holding 8000 worshippers. The nave's roof is 150 feet high. 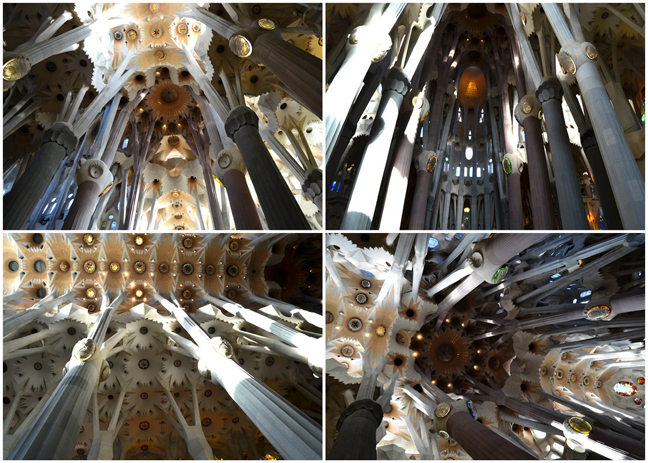 The crisscross arches of the ceiling show off Gaudí's distinctive engineering. Doesn't it look like bones a little bit? Yes? No? Maybe? 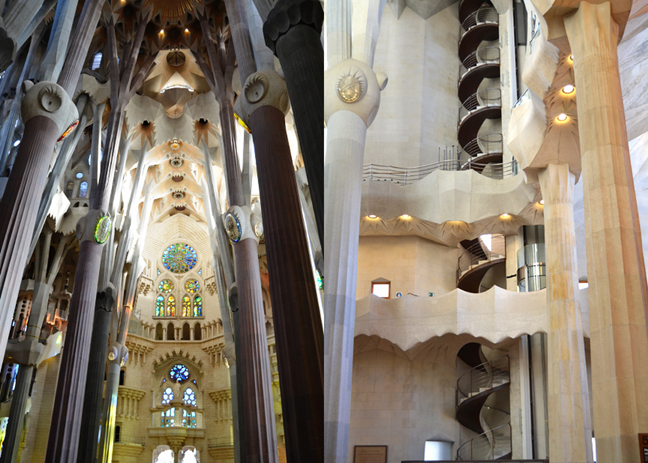 Books could be written about the Sagrada Família, and have been, so I'll just leave it at that! You can buy tickets to get partway up the towers, but they were sold out. Another reason to come back! Basically, this is an amazing building that I hope to see finished in my lifetime! 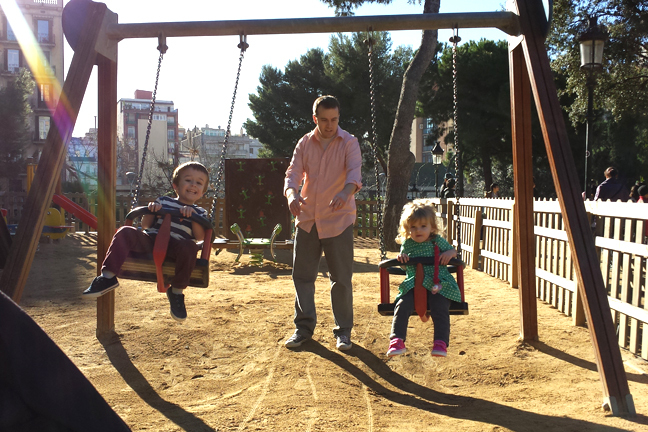 After reveling in the Sagrada Família we walked across the street to a little park and let Fox and Jane play in the swings. How fun to be basking in the shadows of such an amazing building just a couple yards away! Fox having the time of his life! On to the next sights in the Eixample! 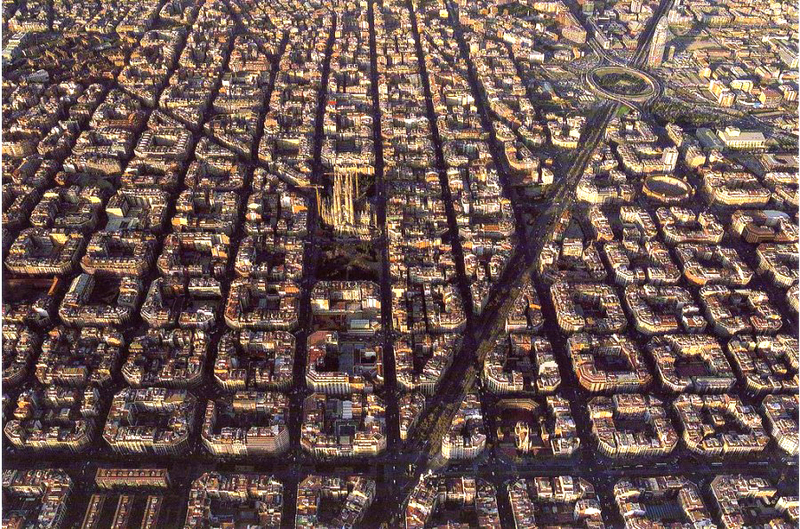 The Eixample, the area around La Sagrada, was built when a bulging Barcelona burst out of its medieval walls in the mid-19th century. With wide sidewalks, shade trees, chic shops, and plenty of Art Nouveau fun, this carefully planned "new town" just north of the Old City has a rigid plan cropped back at the corners to create space and lightness at each intersection. Conveniently, all of this new construction provided a generation of Modernista architects with a blank canvas for creating boldly experimental designs. We started at the Casa Milà, which was completely covered up, with Nissan advertisements nonetheless! 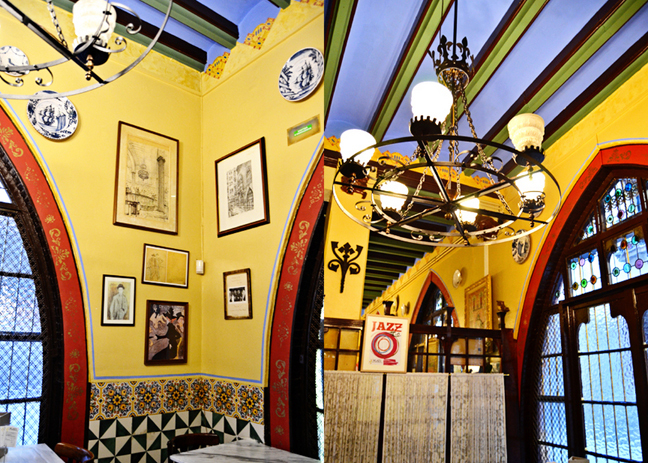 One of Gaudí's trademark works, this corner house - nicknamed "the Quarry" - is an icon of Modernisme. 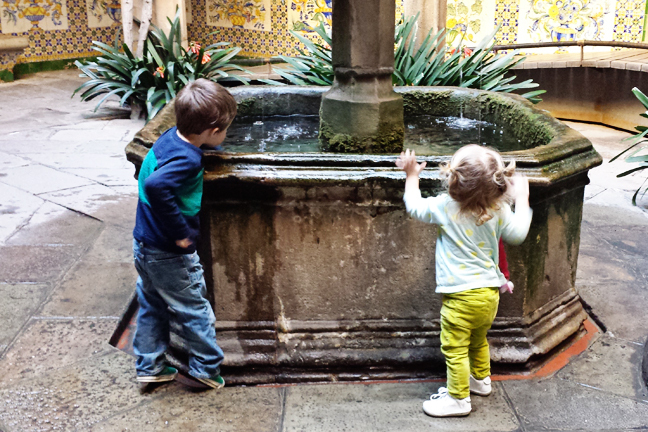 You can go in and look around at all the fun Gaudí designs, but we took a raincheck. This funktacular building is the Fundació Antoni Tàpies. 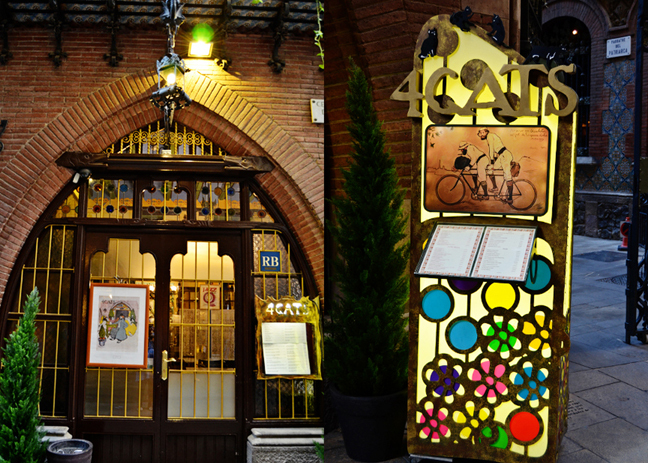 It's a cultural center and museum dedicated mainly to the life and works of the painter Antoni Tàpies. The Fundació was created in 1984 by the artist Antoni Tàpies to promote the study and knowledge of modern and contemporary art. Constructed of modern brick, iron, and glass, it's decorated with playful motifs and is spacious, functional, and full of light. 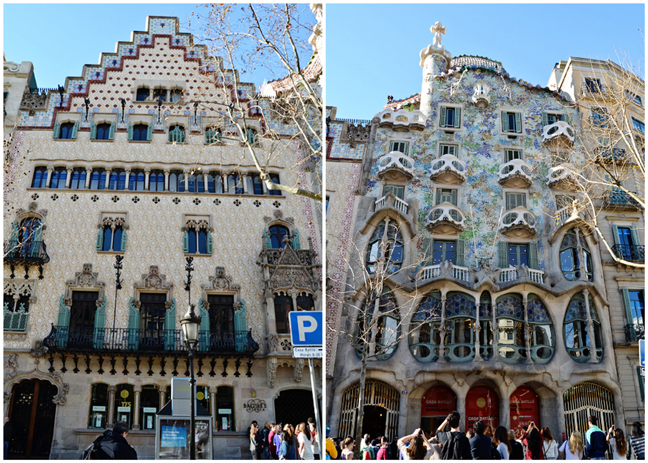 Three colorful Modernista facades compete for your attention along a single block: Casa Batlló, Casa Amatller, and Casa Lleó Morera. All were built by well-known architects at the end of the 19th century. Because the mansions look as though they are trying to outdo each other in creative twists, locals nicknamed the noisy area the "Block of Discord." The most famous green-blue ceramic-speckled facade of Casa Batlló, designed by Gaudí, has an interior open to the public. Casa Batlló has tibia-like pillars and skull-like balconies (I think they look like Phantom of the Opera masks) inspired by the time-tested natural forms that Gaudí knew made the best structural supports. The tiled roof has a soft-ice-cream-cone turret topped with a cross. The humpback roofline suggest a cresting dragon's back. 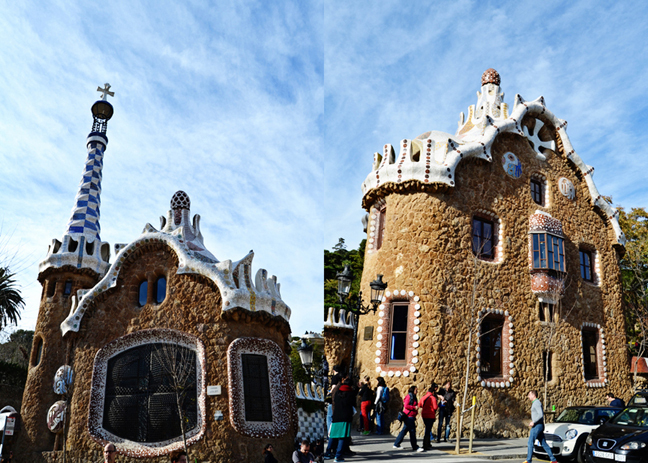 It's thought that Gaudí based the work on the popular legend of St. George slaying the dragon. Others think it's a Mardi Gras theme with mask-like balconies and colorful confetti-like facade. The inscrutable Gaudí preferred to leave his designs open to interpretation. Next door to the Casa Batlló is the Casa Amatller. 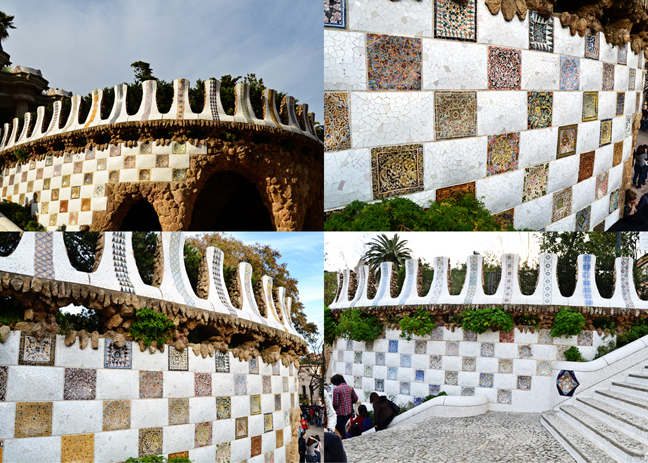 Josep Puig i Cadafalch custom-designed this house for the Amatller family - in the shape of an "A". The facade features a creative mix of three of Spain's historical traditions: Moorish-style pentagram-and-vine designs; Gothic-style tracery, gargoyles, and bay windows; and the step-gable roof from Spain's Habsburg connection to the Low Countries. 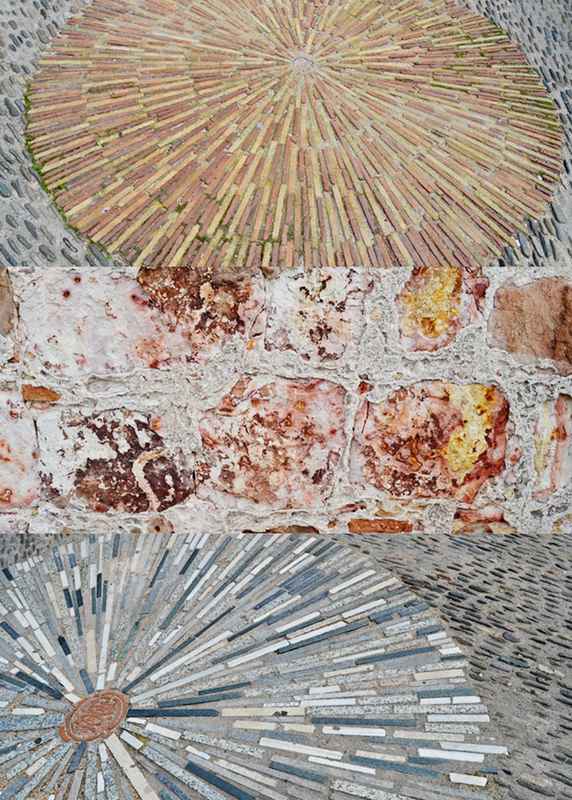 The walkway in front of these buildings is made of these intricate stones. Love! At the end of the Block of Discord is the Casa Lleó Morera. 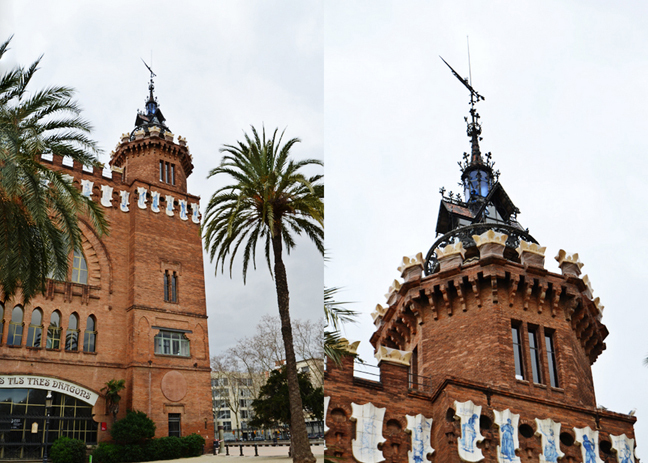 Another paella-like mix of styles, this one by the architect Lluís Domènech i Montaner, who also designed the Palace of Catalan Music. The lower floors have classical columns and a Greek-temple-like bay window. Farther up are Gothic balconies of rosettes and tracery, while the upper part has faux Moorish stucco work. The whole thing is ornamented with fantastic griffins, angels, and fish. Flanking the third-story windows are figures holding the exciting inventions of the day - the camera, lightbulb, and gramophone - designed to demonstrate just how modern the homeowners were in this age of Modernisme. Details from our walk through the Eixample. Chris drinking from one of the many fountains. Time for another self-guided walk down The Ramblas, care of our buddy, Rick Steves! It began at the Plaça de Catalunya, described earlier. 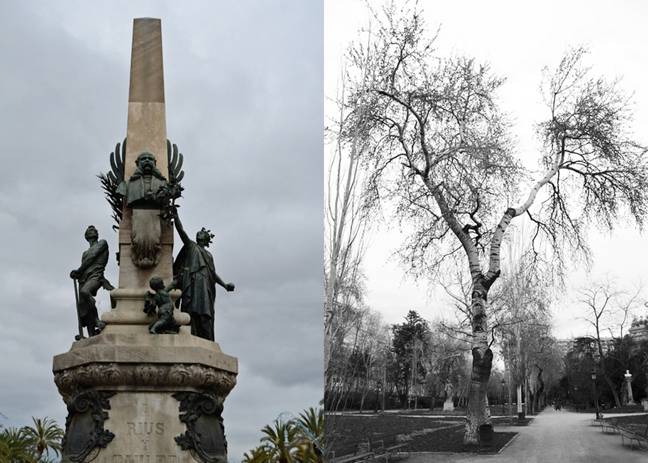 For more than a century, this walk down Barcelona's main boulevard has drawn locals and visitors alike. While its former elegance has been tackified somewhat by tourist shops and fast-food joints (of which we partook of three times), this still has the best people-watching in town. 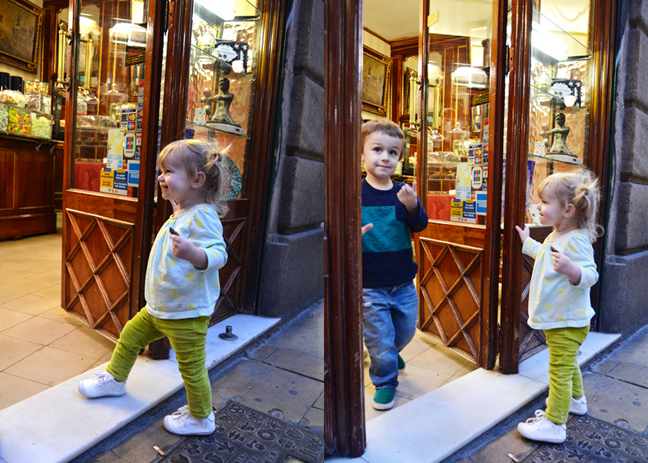 The Ramblas is two different streets by day and by night, though we're a little intimidated to be out late with the kids, so we chose the day time. The pedestrian-only Champs-Elysées takes you from rich (at the top) to rough (at the port). In the middle of the Plaça de Catalunya Fox watched intently as these street workers made ginormous bubbles. Fox put a tip in their collection hat. Before we started on another walk we ate lunch at Burger King. Fast, easy, we know the kids will eat it, short wait time; sorry to disappoint those who really want us to delve into the culture. Maybe when the kids are a little older and more behaved. With food in our bellies, we were ready to tackle the crowded Ramblas! At the top of the Ramblas is the Fountain of Canaletes. 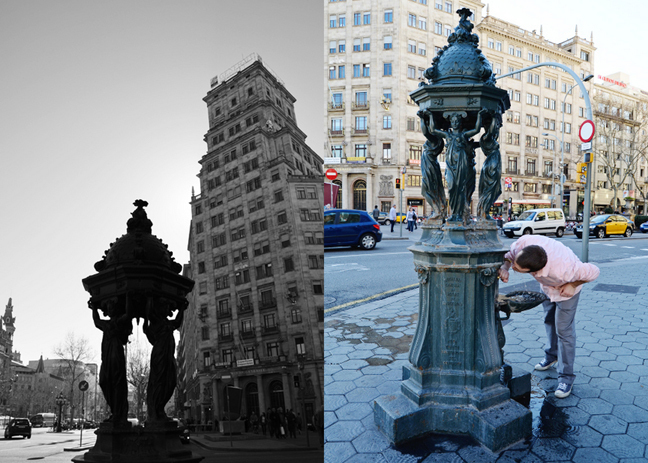 This fountain has been a local favorite for more than a century. 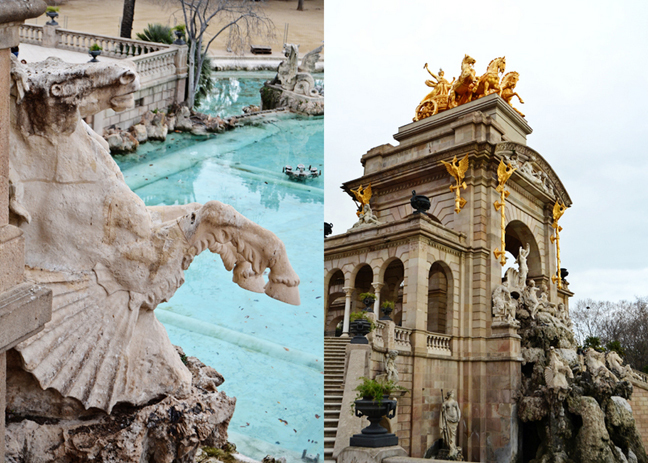 When Barcelona tore down its medieval wall and transformed the Ramblas from a drainage ditch into an elegant promenade, this fountain was one of its early attractions. 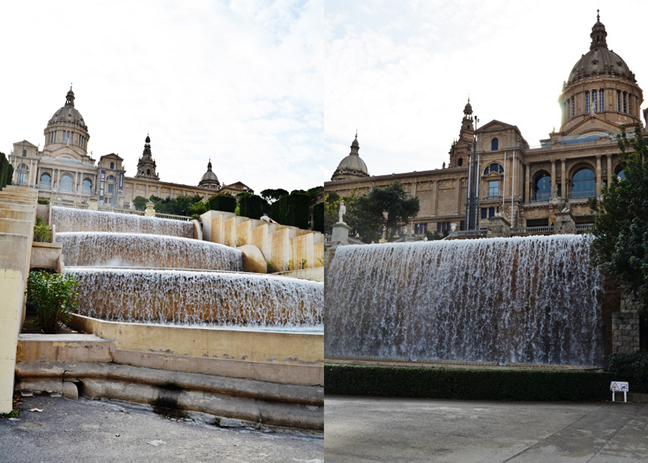 Legend says that a drink from the fountain ensures you'll come back to Barcelona one day. Well move on over and let me take a swig! 100 yards downhill is the Royal Academy of Science where the clock marks official Barcelona time. Supposedly there are usually a medley of surreal and goofy human statues lining the streets that have to AUDITION and be registered by the city government! Who knew! I want to see! And only 15 performers with creative and elaborate costumes may be at work along the Ramblas at any one time. Too funny. We didn't see any though - maybe in the spring/summer/fall when it's not as cold - which reminds me, we were in t-shirts enjoying the 60+ degree weather while everyone else was in puffy coats and scarves! It did get cold enough for us to wear jackets on the 3rd day, but the 1st and 2nd days were so warm and sunny it felt like summer! We turned down the passageway by the Citadines Hotel and found the Roman Necropolis. In Roman cities, tombs (outside the walls) typically lined the roads leading into town. Emperor Augustus spent a lot of time in modern-day Spain conquering new land, so the Romans were sure to incorporate Hispania into the empire's infrastructure. This road led into the Roman port of Barcino. Today's highway to France still follows the route laid out by this Roman thoroughfare. Looking down at the ruins we saw how Roman Barcino was about 10 feet lower than today's street level. So interesting! 100 more yards downhill we turned left at Carrer de la Portaferrissa to see the decorative tile over a small fountain. 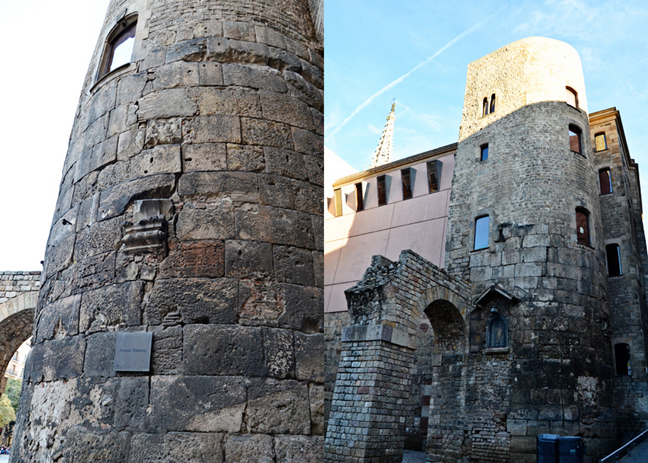 The scene shows the original city wall with the gate that once stood here and the action on what is today's Ramblas. Next we crossed the road to the Betlem Church. It's dedicated to Bethlehem and for centuries locals have flocked here at Christmastime to see Nativity scenes. The church is 17th-century Baroque with the sloping roofline, ball-topped pinnacles, corkscrew columns, and scrolls above the entrance. 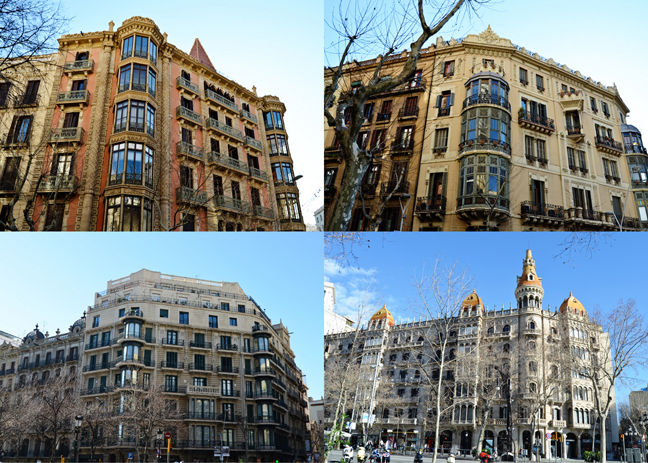 The Baroque and Renaissance styles are relatively unusual in Barcelona because it missed out on several centuries of architectural development. Barcelona enjoyed two heydays: during the medieval period (before the Renaissance) and during the turn of the 20th century (after Baroque). In between those periods, from about 1500 until 1850, the city's importance dropped (because of the previously mentioned Christopher Columbus discovering America and the Spanish crown keeping Catalunya on a short leash). For a sweet treat we headed down the narrow lane behind the church to the Café Granja Viader which has specialized in baked and dairy delights since 1870. We got the recommended Cacaolat milk Barcelonans love. It 'twas good! 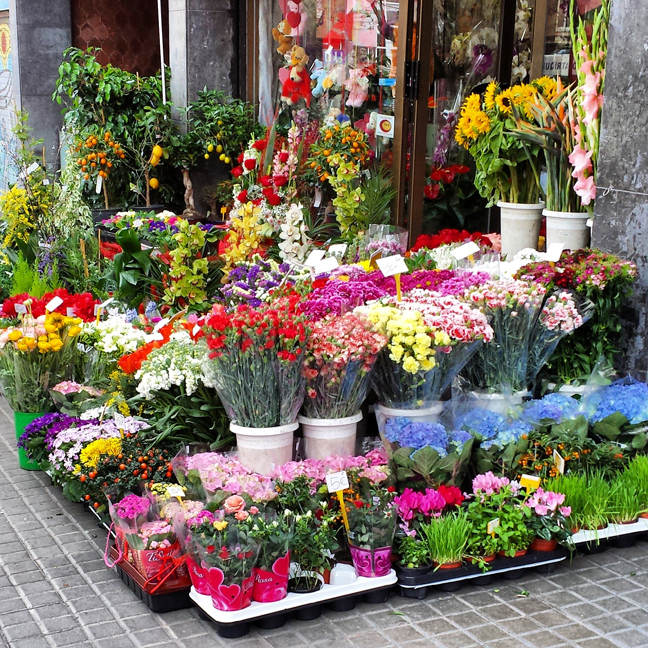 The next block of the Ramblas is lined with colorful flower stands. 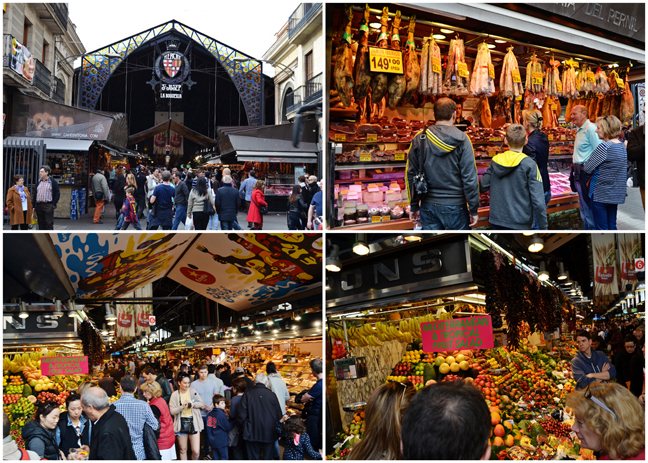 Continuing down the Ramblas is Barcelona's great covered market, La Boqueria. We caught a glimpse of the medieval church tower of Santa Maria del Pi, a popular venue for guitar concerts. The Chinese dragon holding a lantern (above picture) decorates a former umbrella shop (hence the umbrellas on the side of the building). More St. George love! At the Liceu Metro station the Ramblas widens a bit into a small, lively square Plaça de la Boqueria). 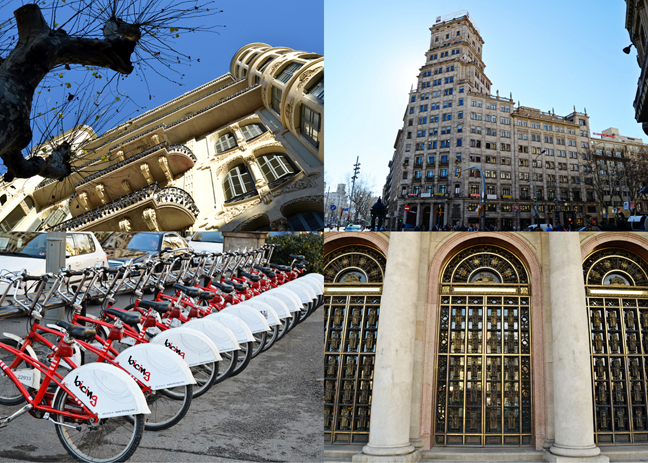 Liceu marks the midpoint of the Ramblas, halfway between Plaça de Catalunya and the waterfront. Underfoot in the center of the Ramblas is the red-white-yellow-and-blue mosaic by homegrown abstract artist Joan Miró. The mosaic's black anchor represents an anchor - a reminder of the city's attachment to the sea. After a few more steps is the Liceu Opera House which hosts world class opera, dance, and theater. Neato! 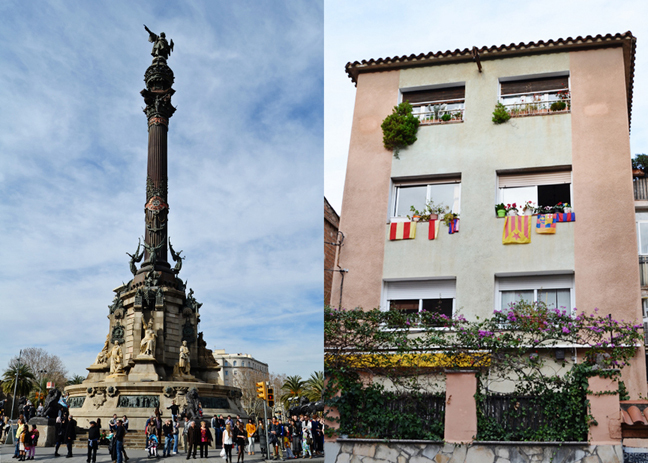 At the bottom of the Ramblas is the Columbus Monument and waterfront. 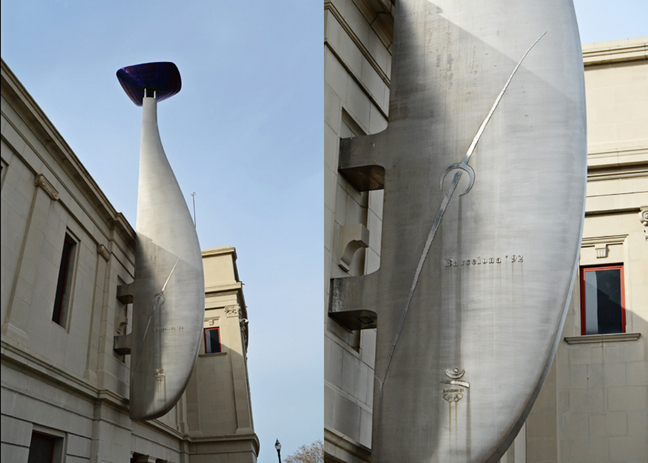 The 200-foot column commemorates Christopher Columbus' stop in Barcelona after his first trip to America. Barcelona is one of Europe's top 10 ports, though this stretch is a pleasant marina with sailboats. The Port Authority building looks just like castles we see here in Germany! The pedestrian bridge jutting into the harbor is a modern extension of the Ramblas called La Rambla del Mar. This popular wooden bridge - with waves like the sea - leads to Maremagnum, a shopping mall with a cinema, a huge aquarium, and restaurants. The official walk was over so we strolled along the promenade, soaking up the sun and palm trees we've missed since leaving So Cal. 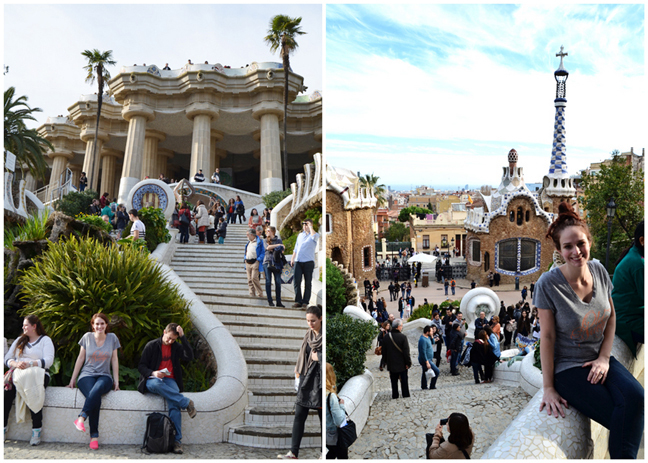 We found our way back to the hotel, took naps, and then headed out once again, this time to Park Güell! All of the pictures that got me most excited about Barcelona were taken from Park Güell so I was excited to finally head up there! 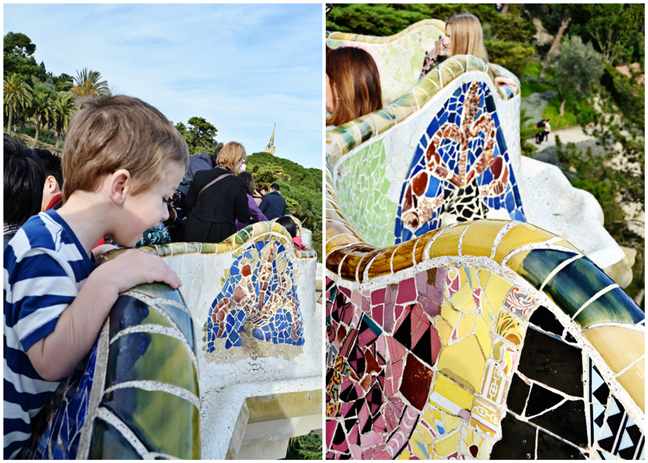 Gaudí fans enjoy the artist's magic in this colorful park, located on the outskirts of town. 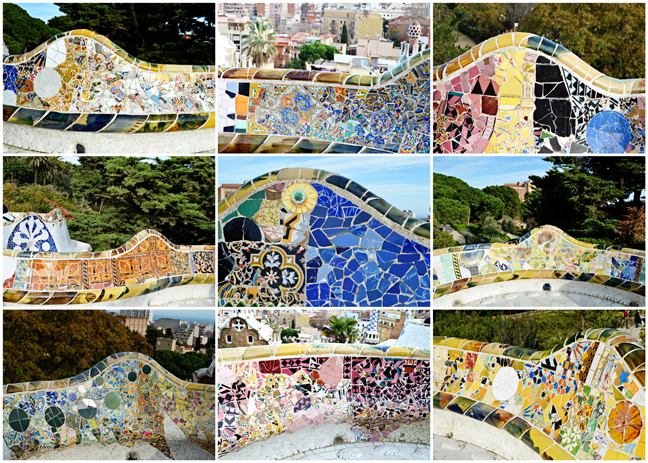 Park Güell offers a unique look at Gaudí's natural style in a natural rather than urban context. 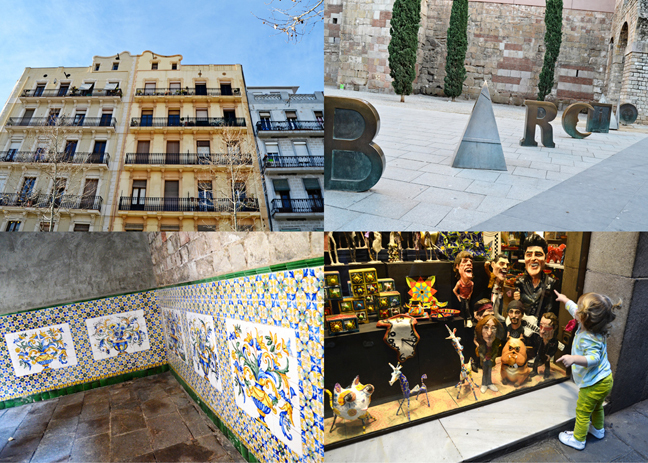 Designed as an upscale housing development for early-20th-century urbanites, the park is home to some of Barcelona's most famous symbols - hence I wanted to see it, stat! Two gate buildings that look like gingerbread houses flank the entrance. There was a long line to get tickets, but I waited while Chris took the kids to a little playground in the park. When I finally made it up the front I was a Euro short for the tickets! I had to book it back to Chris, get a darn Euro, and then run back. I heard people yelling "Seriously? Over a Euro?" Made me feel good... Anyway, we got tickets and then headed into the park! I spy Chris among the fun, angular columns. At last we made it to the top where we got our first really good view of Barcelona! Oh beautiful Barcelona! 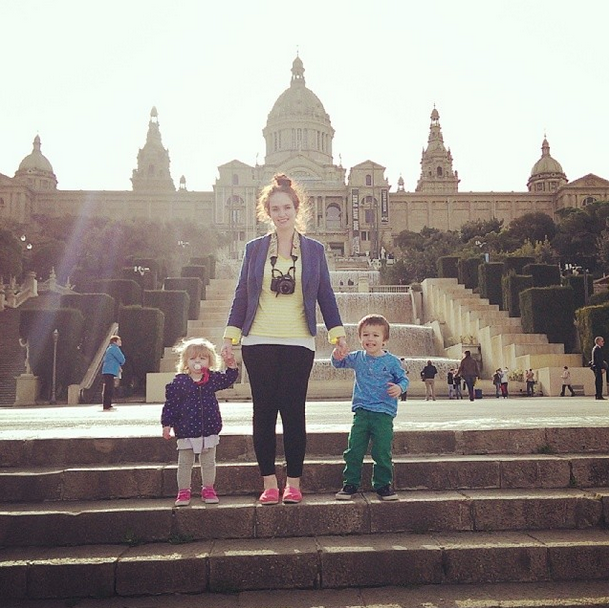 The Evans Family, Barcelona, February 2014. Fox enjoyed looking down at people. The benches were designed to fit your body ergonomically. So comfortable and stylish, of course! I enjoyed all of the beautiful, colorful tile work! WOW! Fox looking out at Barcelona. More scenes from the park. The Hall of 100 Columns - designed to house a produce market for the neighborhood's planned 60 mansions. The fun columns, each different, made from concrete and rebar, topped with colorful ceramic, and studded with broken bottles and bric-a-brac - add to the market's vitality. Looking up in the Hall of 100 Columns. Everyone and their dog was taking pictures of this ceramic dragon, so I did too! It's a famous icon of the park. 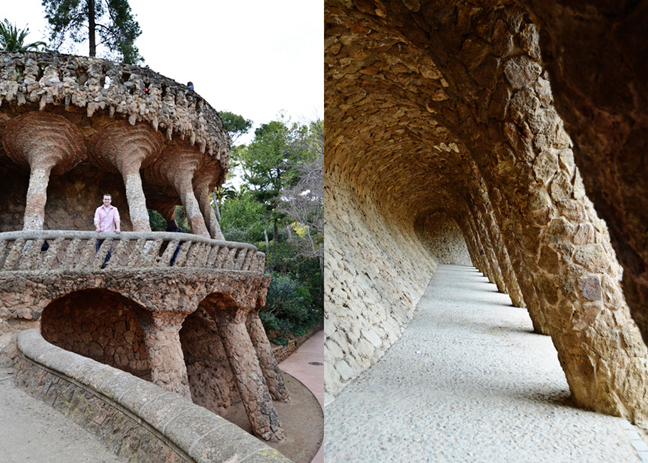 Totally one of my favorite places in all of Barcelona, and Europe for that matter! Instead of taking the bus back down we decided to walk. We passed these flower pots made right into the wall. Layers and layers of buildings and homes. Back at the hotel we ordered a pizza for dinner. Once it got dark we walked a few blocks to another icon of Barcelona - the Torre Agbar. We could see this lit up at night when we were walking back to our hotel so we had to see it up close! The Torre Agbar is a 38-story skyscraper located between Avinguda Diagonal and Carrer Badajoz, near Plaça de les Glòries Catalanes, which marks the gateway to the new technological district of Barcelona. It was designed by French architect Jean Nouvel. 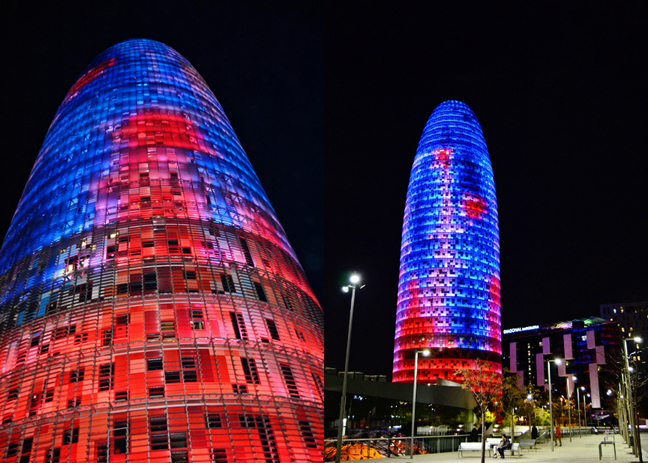 The Torre Agbar is named after its owners, the Agbar Group, a holding company. 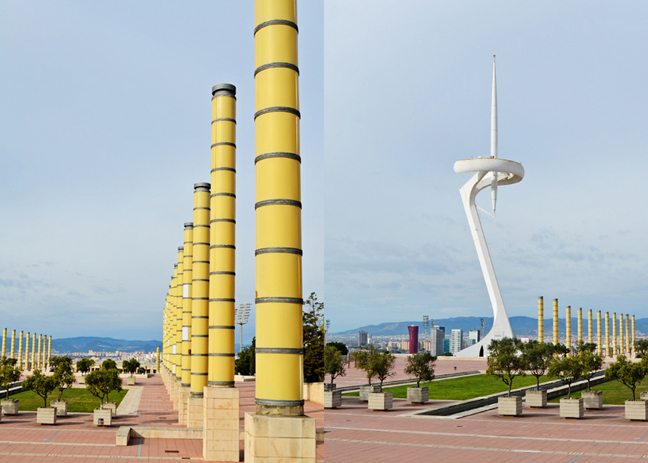 According to Jean Nouvel, the shape of the Torre Agbar was inspired by Montserrat, a mountain near Barcelona, and the shape of a geyser rising into the air. Jean Nouvel, in an interview, described it as having a phallic character... Keep it PG please people! 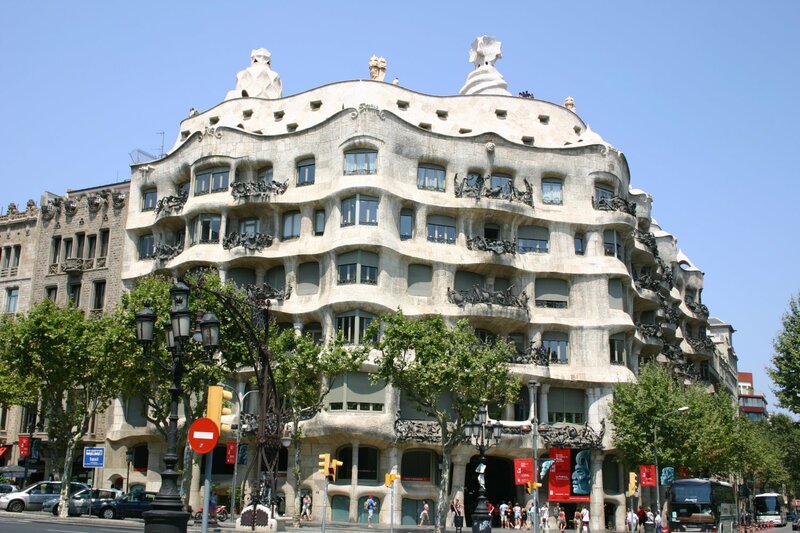 :) As a result of its unusual shape, the building is known by several nicknames, such as "el supositori" (the suppository), "l'obús" (the shell) and some more scatological ones, lol. It is also somewhat similar in shape to Sir Norman Foster's 30 St. Mary Axe in London, often called "the Gherkin". It is the third tallest building in Barcelona, only after the Arts Hotel and the Mapfre Tower. A defining feature of the building is its nocturnal illumination. It has 4500 LED luminous devices that allow generation of luminous images in the façade. In addition, it has temperature sensors in the outside of the tower that regulate the opening and closing of the window blinds of the façade of the building, reducing the consumption of energy for air conditioning. Up ahead we noticed a strange and unusual mirror-like contraption above what looked like a market and just had to check it out. We passed this fun sculpture on the way. 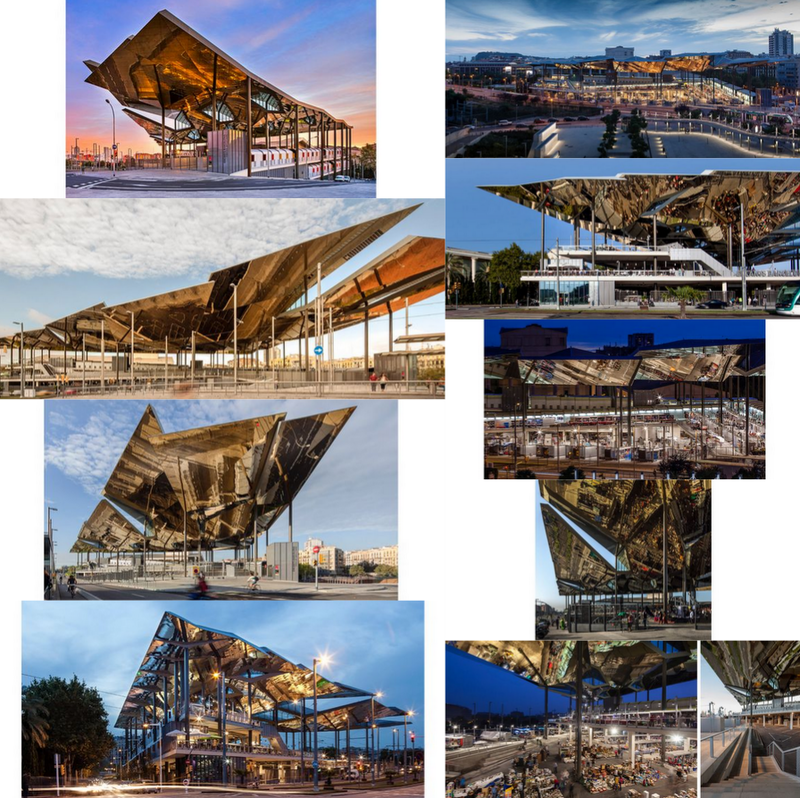 After googling it (still under construction on Google Maps) it looks like this is the Mercat dels Encants. It's a market and the roof is made of a reflection mechanism for the city to see down into the market. Each section has a different angle to reflect the light and magnifies it a bit. It's crazy to see in real life. It looks like video monitors displayed up-side-down and magnified and it's just really weird. And of course, really cool. We headed back to the hotel for the night and went to sleep right away, exhausted, tired, and happy for all that we saw! The next morning we woke up, showered, ate breakfast, and headed to the city dominating Montjuïc, or "Mount of the Jews." To get there we had to take a funicular. It wasn't opened for another half hour so we walked around until it was go-time. 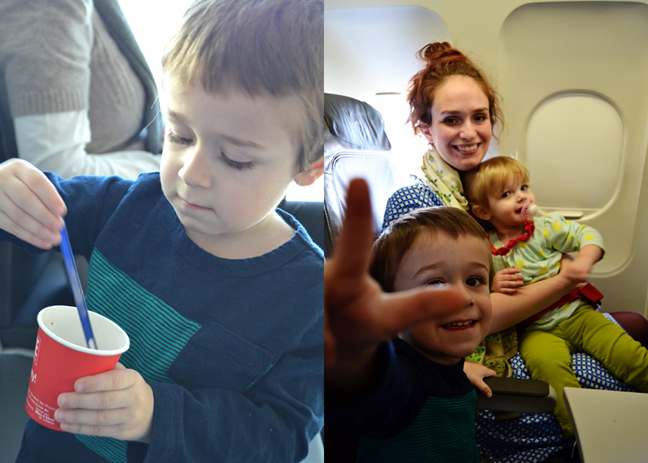 We're early risers, even on vacation. Here we are at the top taking the elevator up and out! If only these trees weren't here so we could see the magnificent view of Barcelona! I kid I kid, I love trees. But darn what I wouldn't give to see out! We headed straight for the fortress. Which wasn't opened or something? The security dude told us "no". Darn! Striking out all over the place! Ages ago an impressive castle stood here. When the Spanish enforced their rule, they built the imposing fortress that we see the shell of today. It was built to keep an eye on Barcelona and stifle citizen revolt. When the 20th-century dictator Franco was in power the castle was the site of hundreds of political executions... yikes... Its military function gone, these days it serves as a park, jogging or biking destination, and host to a popular summer open-air cinema. The hill also played an integral role in the construction of Barcelona's great structures - significant parts of the historic city, the cathedral the Sagrada Família, and much more were all built with stones quarried from Montjuïc. We caught glimpses here and there from the fortress out to the Mediterranean. And tried to see more of Barcelona through the trees. I'm always impressed by things that are made pretty when they usually aren't - like this intricate walkway. We took the bus down the hill a bit to the Olympic Stadium. Aside from the memories of the medals, Barcelona's Olympic Stadium, originally built for the 1929 World Expo, offers little to see today. But the doors were open so we stepped inside! Panoramic view from my handy dandy phone. Fun to imagine this place during the Olympics! The 2014 Winter Olympics are happening as I write this! Next to the Olympic Stadium is the Palau Sant Jordi - an indoor sporting arena and multi-purpose installation. Designed by the Japanese architect Arata Isozaki, it was opened in 1990. Looking back at the Olympic Stadium. 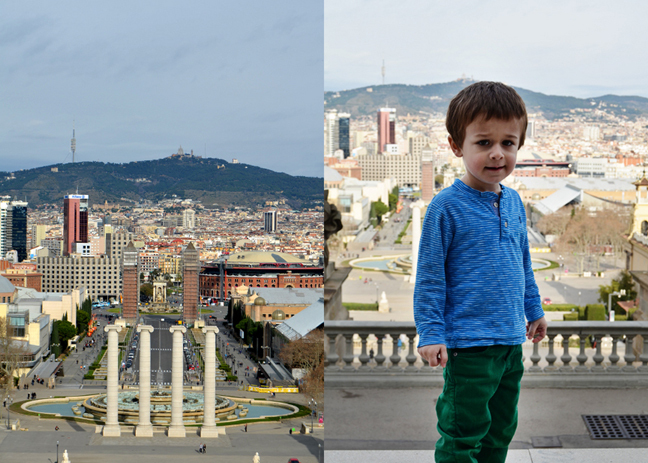 Then we walked down the hill and took an outdoor escalator (they're everywhere on Montjuïc! It must not rain much?) 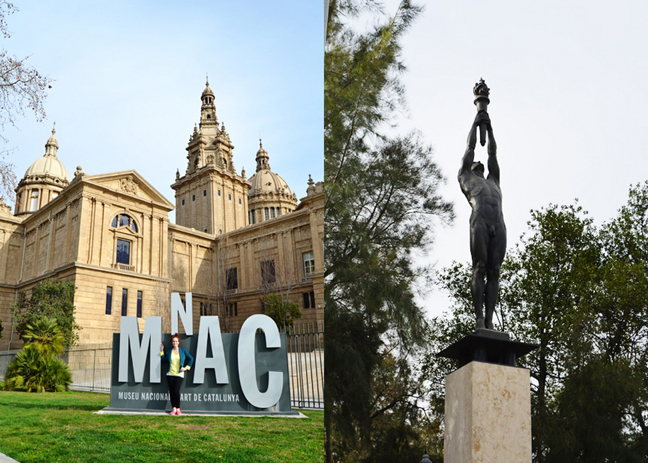 to the Catalan Art Museum - or Museu Nacional d'Art de Catalunya, hence the MNAC. The big vision for this wonderful museum is to showcase Catalan art from the 10th century through about the mid-20th century. Often called the "Prado of Romanesque art" it holds Europe's best collection of Romanesque frescoes. It also offers a particularly good sweep of modern Catalan art. Me in front of the MNAC and an Olympics statue. With the World Expo in 1929, Montjuïc morphed into an extravagant center for fairs, museums, and festivals. Except for the factory (now housing the CaixaForum) and the bullring, everything here dates from 1929. The expo's theme was to demonstrate how electricity is more than lightbulbs: Electricity powered the furnicular, the glorious expo fountains, the many pavilion displays, and even the flame atop the fountain marking the center of Plaça d'Espanya (and celebrating the electricity company that sponsored the show). View of Barcelona from the entrance of the MNAC. Gorgeous and picture-perfect steps by the MNAC. This entire area is so beautiful and fun to walk through/around/in/by. Fountains, fountains, and more fountains! Jane running free at the 1929 World Expo Fairgrounds. Me'n'Fox'n'Jane in front of the MNAC. The Magic Fountains in the middle of the 1929 World Expo Fairgrounds. Music, colored lights, and huge amounts of water make an artistic and coordinated splash in the evening. We were never here in the evening, so obviously we must come back one day to see this show! Every level leading up to the MNAC is unique and photographable. Across the street is the CaixaForum. 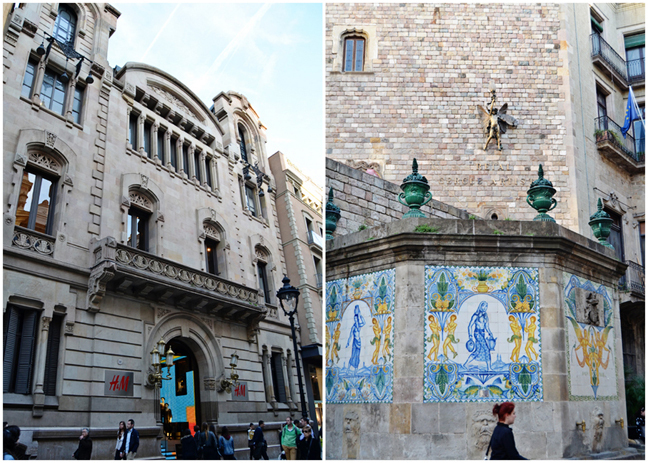 The CaixaForum Social and Cultural Center (sponsored by the leading Catalan bank) is housed in one of Barcelona's most important Art Nouveau buildings. In 1912 Josep Puig i Cadafalch (a top architect often overshadowed by Gaudí) designed the Casaramona textile factory which showed off Modernista design in an industrial rather than a residential context. It functioned as a factory for less than a decade then later served a long stint as a police station under Franco. Beautifully refurbished, the facility reopened in 2002 as a great center for bringing culture and art to the people of Barcelona. We went inside, but we were so tired from the morning that we quickly looked around and then headed back to the hotel. To get to the Metro we walked once again through the Plaça d'Espanya, but this time we didn't have a ton of luggage so it was easy breezy! Across from the Plaça d'Espanya is the Las Arenas - or Bullring Mall. What do you do with a big arena when bullfighting is outlawed? Make a mall, haha. The grand Neo-Moorish Modernista plaça de toros functioned as an arena for bull fights from around 1900 to 1970 then reopened in 2011 and now hosts everything you'd expect in a modern mall: lots of famous shops, a food-circus basement, a 12-screen cinema complex, rock-and-roll museum, and a roof terrace with spectacular views. A modular building at the Plaça d'Espanya. We got on the Metro then transferred at the Plaça de Catalunya where a protest was taking place. We quickly got into the elevator and back down to the Metro. We rested for a bit at the hotel and then left around 3pm to go to the Picasso Museum that is free on Sundays after 3pm. Apparently we aren't the only cheapskates in Barcelona. Everyone and their dog was lined up to go in that museum. We don't do long lines (which is something we're going to have to overcome when we go to Disneyland Paris next month...) so we walked over to Citadel Park. 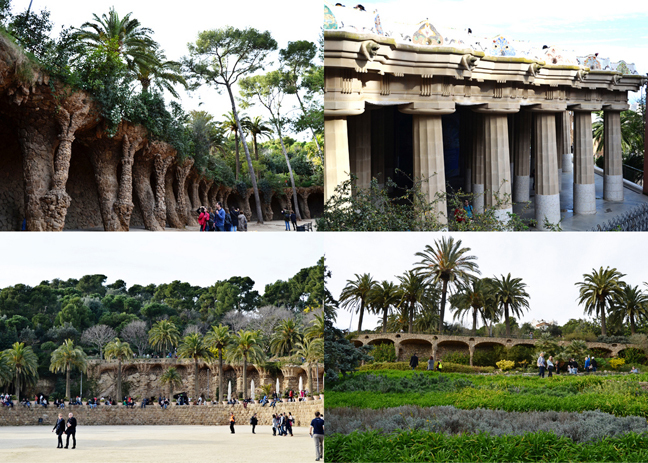 In 1888 Barcelona's biggest, greenest park, originally the site of a much-hated military citadel, was transformed for a Universal Exhibition (World's Fair). The first building we came across was the Castle of the Three Dragons. We walked down the Passeig de Lluís with the Arch de Triumph as our final destination and passed the Palace of Justice. Sitting in front of the stately Triumphal Arch which celebrates the removal of the citadel. Walking deeper into the park. We spotted the gold statue from far away and had to see what it was up close. THIS! WOW! The Cascada (or, waterfall) was erected by Josep Fontsére and to a small extent by Gaudí who at the time was still unknown and just an assistant. Fontsére aimed to loosely make it bear resemblance to the Trevi Fountain of Rome. Anyone know who the statue on top is? Google has failed me, wah wah. Okay, one last look, cuz this is awesome-sauce. Pretty flowers in Citadel Park. We went to sleep at 8pm, no joke. What an amazing day! 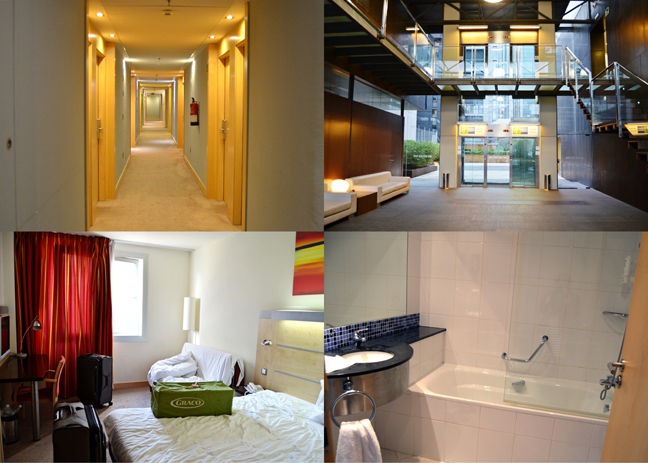 We woke up, showered, packed most of our belongings, ate breakfast, then headed out for our last morning in Barcelona. Destination: the beach! 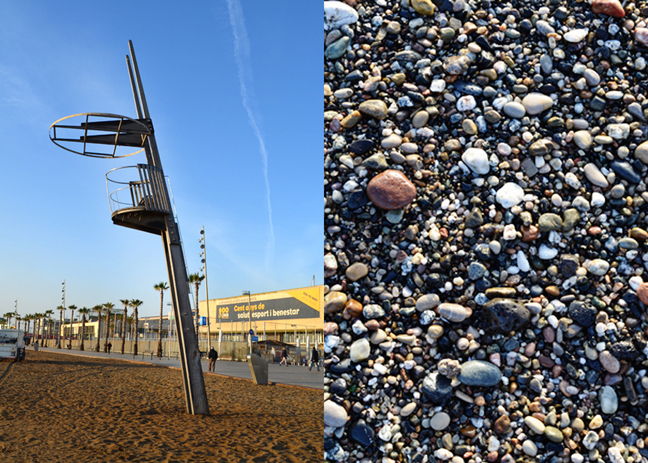 We got off at the Barceloneta Metro stop and walked all the way down Passeig de Joan de Borbó to reach the beach. 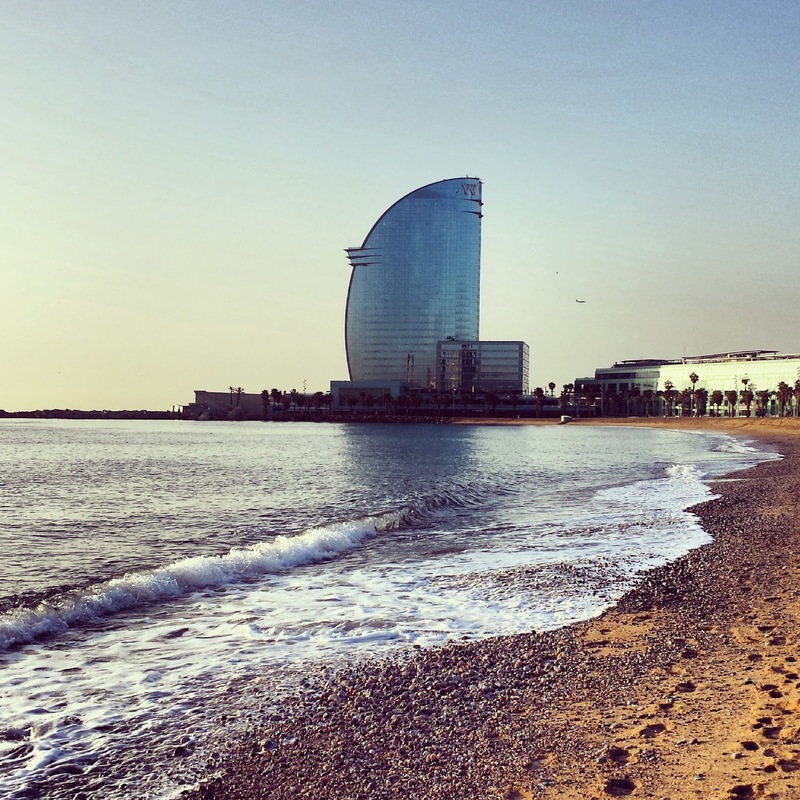 Barcelona has created a summer tourist beach trade by building a huge stretch of beaches east from the town center. Before the 1992 Olympics this area was an industrial wasteland nicknamed the "Catalan Manchester." Not anymore! The industrial zone was demolished and figuratively dumped into the sea while sand was dredged out of the sea bed to make the pristine beaches locals and tourists alike enjoy today. The scene is great for sunbathing and had it been about 15 degrees warmer you would have seen us out there getting our "beach on!" Still, 65 and sunny is a nice way to spend the morning. We couldn't miss the W Hotel, shaped like a windblown sail, dominating the small peninsula! The sun rising and a man walking his dog along the beach. Lifeguard station? Textured rocks at the water's edge. Chris and I both walked down and touched the water - the first time our hands have been in the Mediterranean! Hopefully not the last! This is the picture I 'grammed: "Oh what a beautiful morning! Oh what a beautiful day!" Art sculpture made for the Olympics is my guess. Barcelona's version of May Poles? :) You can see Montjuïc between the two right poles. After basking on the steps in the sun for awhile we turned around and headed back to the hotel to finish packing. One place we never went to that I had my "heart" set on was the Sacred Heart Church waaaay up on the hill, much much higher up than Montjuïc and Park Guëll. Imagine the views from there! (Not my picture, from the interwebs). Next time, next time. Along with so many other things! 3 days just isn't enough! Back at the hotel we finished packing then wised up and took a taxi to the bus that took us to the airport instead of trying to get through the elevator/escalator-less Metros. Riding the bus to the airport. Fox walking along like he knows where he's going at the Barcelona airport. Holy moly, Paige! Thanks for taking so many photos. Gaudi is one of my favorites. I'm so jealous of your 3-day adventure! Über dem Kaskadenbrunnen thronen Triumphbogen und Quadriga. See you at the Crop am Rhein in April. wow!!!! amazing post and love love all your photos, what a cool trip!!!!!! WOW! What an amazing trip. I love every picture but especially the ones of Fox and/or Jane in such amazing places. 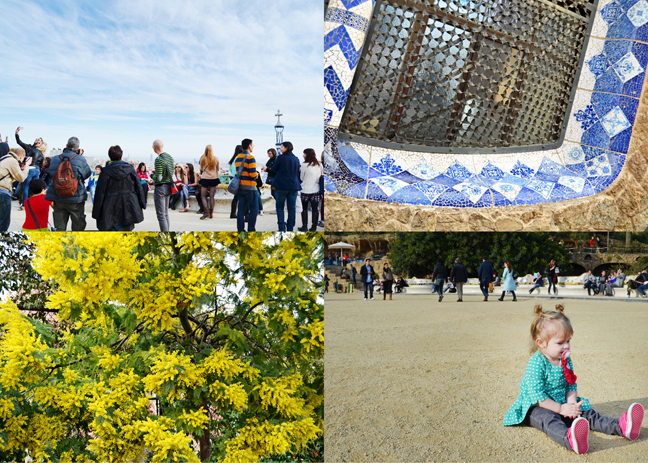 Thank you for sharing all the wonderful adventures and fab photos in Barcelona! Oh gosh, so much to say. Second, I love all those pictures of Fox and Jane hamming it up for the camera. Precious!! 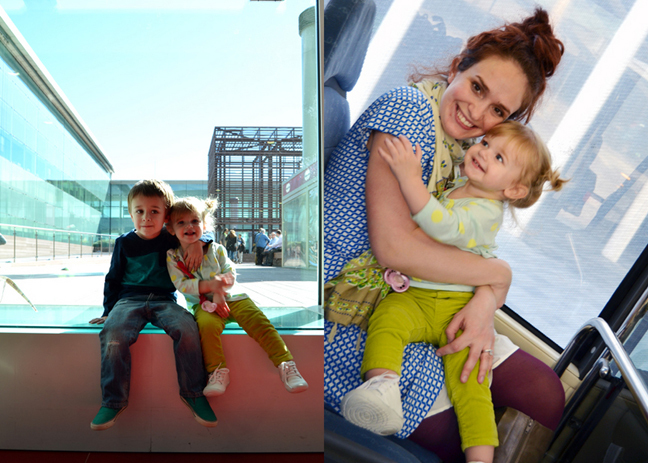 I've said it before but I'll say it again, Jane is getting SO BIG!! 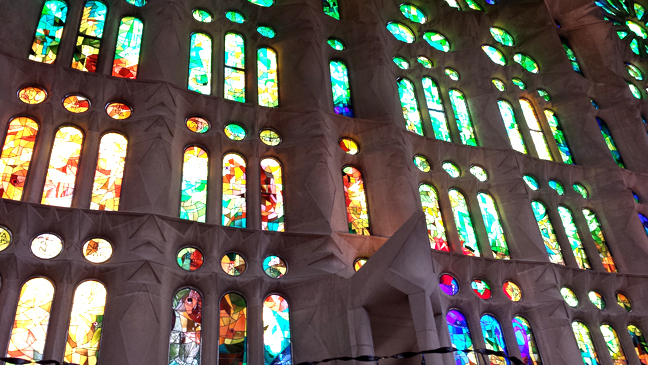 Third, so sad that the La Sagrada Família was under construction but it looks amazing anyway! Love that picture of it from the reflection in the water. Great recap! Reading the post was almost as fun as actually doing all those things! Thanks for all your hard work with these! Seriously, so so sooo awesome. La Sagrada Familia has been on my bucket list forever...and now I can just add the rest of Barcelona as well, what a cool city!! Thanks for posting all these pictures, this was incredible! Seriously - I have blog envy every time I read your posts!!!! Your pictures are AMAZING - I love that you take pictures of all the little details. And your writing is so fun to read and you are the cutest little family!!!! 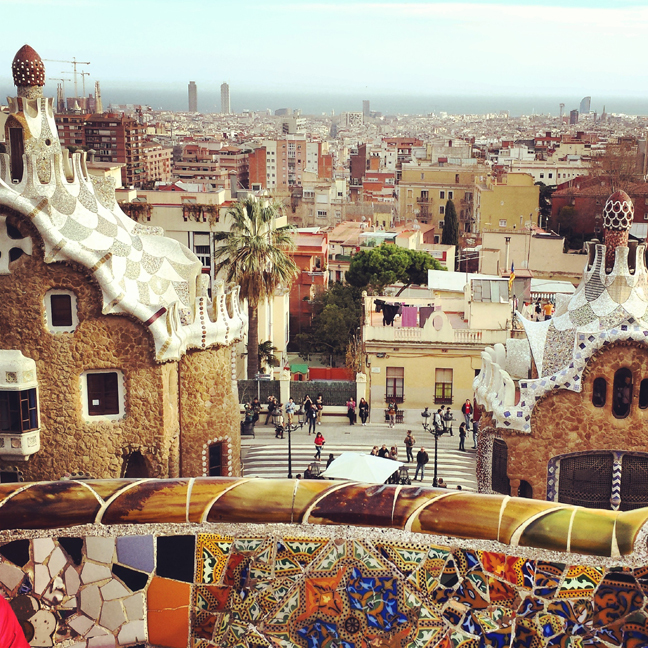 Thanks for sharing your amazing trip to Barcelona, Paige! Since I was "just there"...I love re-visiting through your lenses! 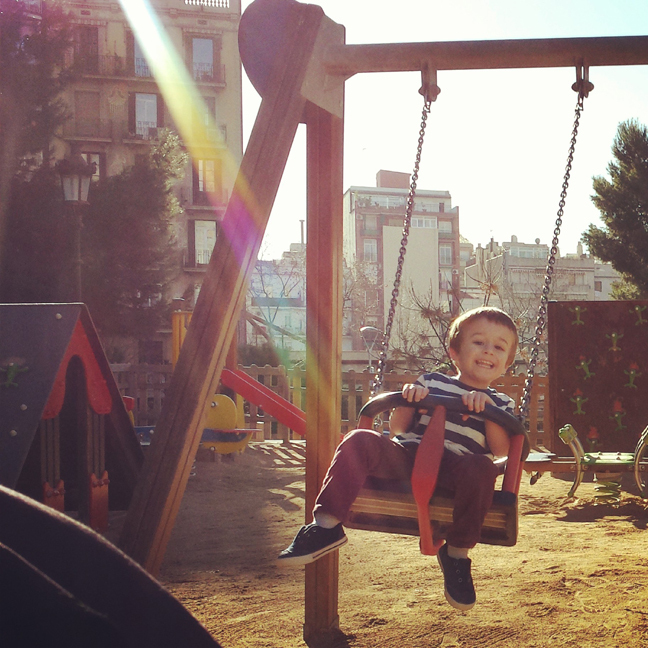 The Ramblas is definitely better to visit during the day with the kids! When we were there at night, it appeared to be a bit sketchy and I found the street vendors more aggressive! Your post reminds me to visit the city again...let's hope that they finish La Sagrada Familia on time :) I absolutely love and enjoy your post!! What and amazing trip, Paige!! The architecture and scenery are so stunning!! Also, how on EARTH do you keep track of everything on trips like this? I mean, you obviously took hundreds of photos, and you do, each time you visit a new city. But then you go home and look up descriptions on Wikipedia and Google. How do you remember which pictures are what? I'm so fascinated by this. You encourage and motivate me so much... to get out with two kids. To explore. To take more photos. To journal. To blog. I love you. Thank you. LOVE your pictures!!! We were there 3 years ago and loved it as well:) It truly is one of the most gorgeous cities in Europe. I hope we can go back again ....we are travelling to Portugal this summer again and have different area of Spain on our agenda as well.